In Ramana’s days he walked pradakshina around Arunachala usually with a group a devotees. 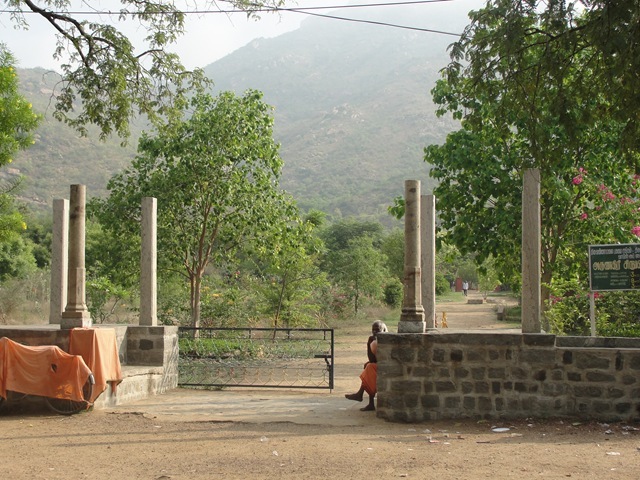 They would take all day, stopping frequently to sit and absorb the grace of Arunachala. They would chant holy verses along the way. The ‘road’ was just a dirt track in those days, used by villagers, bullock carts, and goat herders. Many of the temples and shrines that one sees now did not exist then. 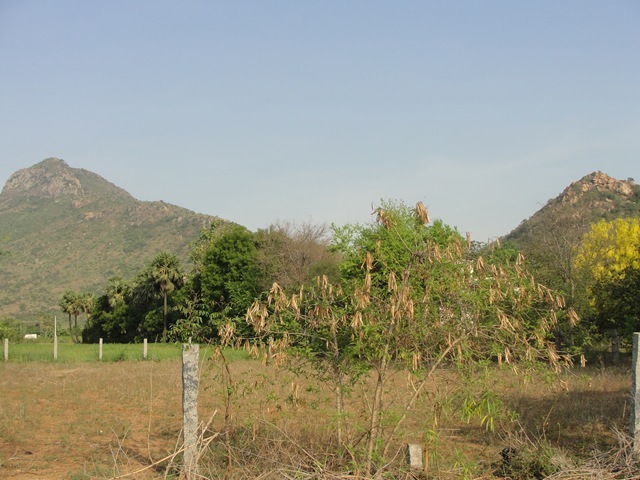 It was a quiet, peaceful track through the South Indian countryside, always with Arunachala in view on the right. 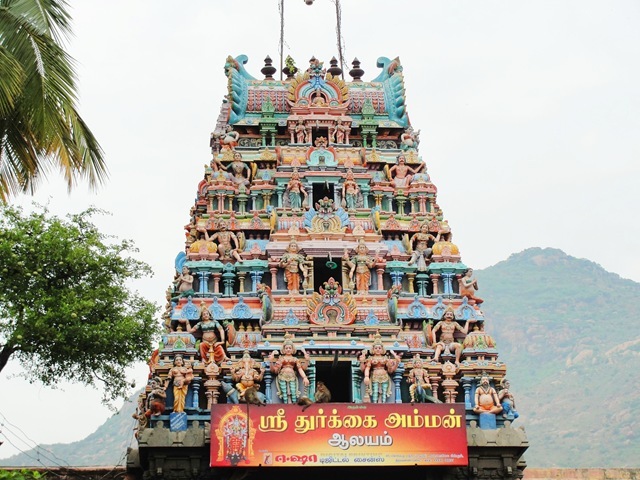 In the past ten years, Arunachala Pradakshina, or Girivalam in Tamil, has become very popular in South India. 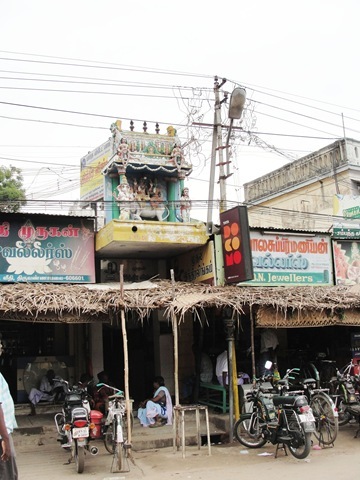 Each full moon night, throngs of 300,000 to over 1,000,000 come to the ancient temple town and spiritual center of Tiruvannamalai to perform Girivalam. Hundreds of buses bring devotees from all over South India. They park on the outskirts of town, make group meals behind the bus, and sleep in the bus. Most walk girivalam in the moon light. Today there are perhaps one hundred holy places along this route. This post shows many of them. 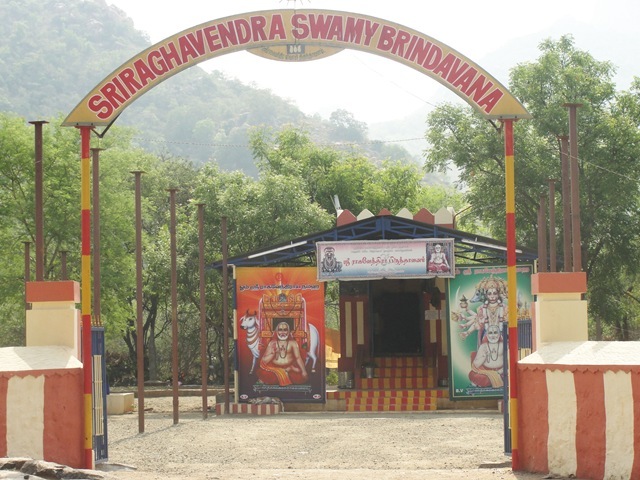 The route shown is one usually used by devotees of Bhagavan Sri Ramana Maharshi. It starts (and ends) at Sri Ramanasramam. 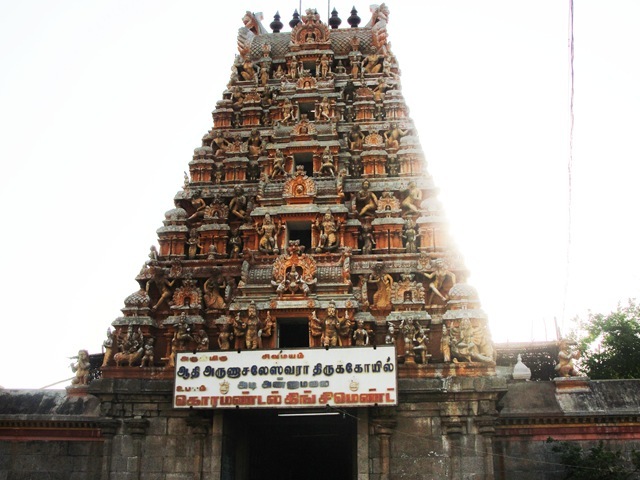 Many South Indians, not devotees of Ramana, will start and end at the big temple, ancient Arunachaleswaraya Temple. 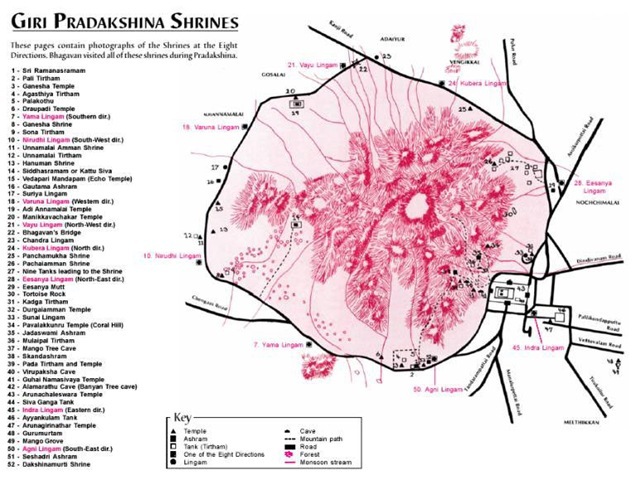 Shown are most of the places mentioned in the book, A Guide to Giripradakshina, published by Sri Ramanasramam. The place names used are from that book, as is some descriptive text. Here is a map of the Outer Pradakshina Path. Link to the map here. 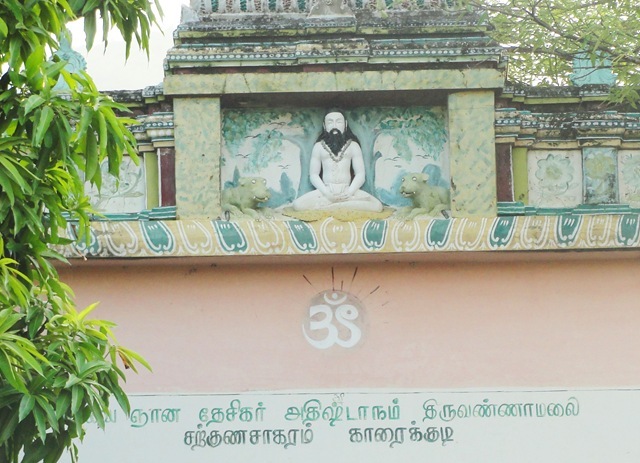 Pradakshina starts at Sri Ramanasramam. Below is the front gate. It is early in the morning and not many people are here yet. Leaving Ramanasramam, one turns right. 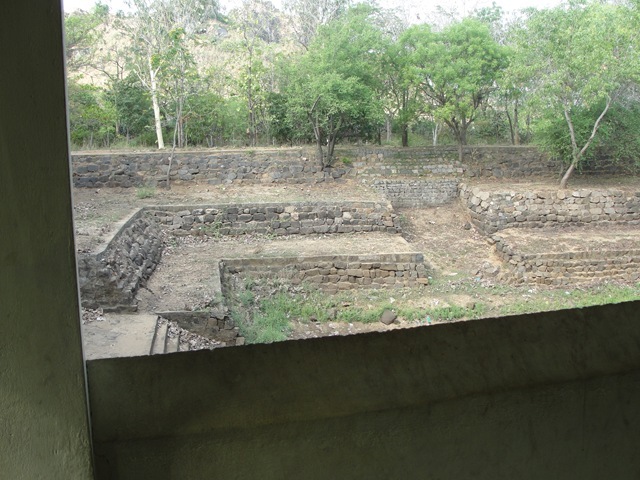 Across the street is Pali Mantapam, no longer in use. Often sadhus are gathered here. 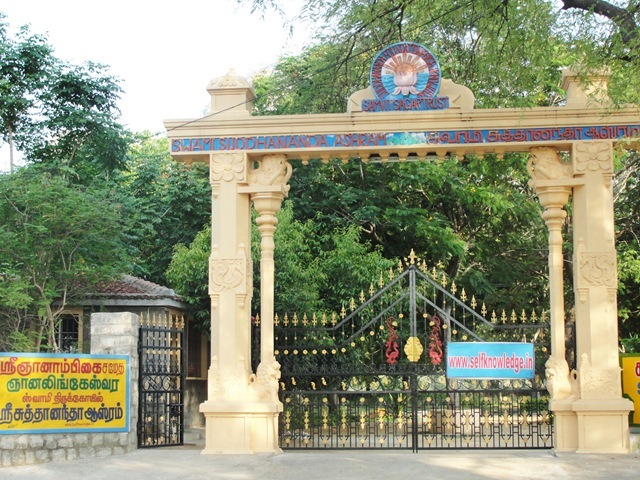 Next to Ramanasramam is Pali Tirtham, which gets much use for various rites and functions. It is also called ‘Manakkula’, which means ‘marriage’. Newly married couples come here for blessings. 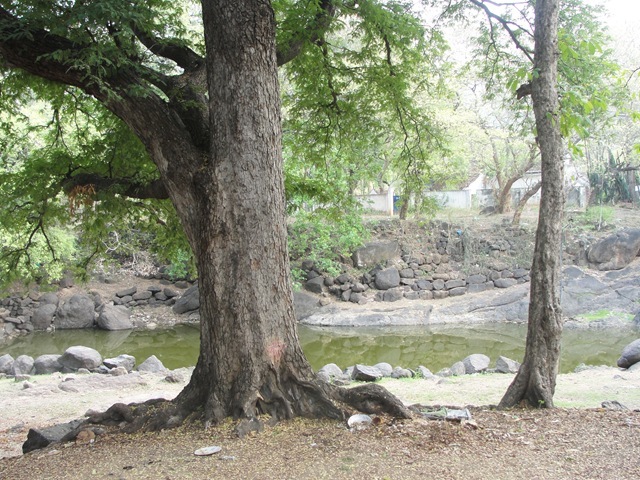 On the roadside bank of the tank, a majestic Peepul Tree (Ficus religiosa) is seen. It has a raised platform around it. 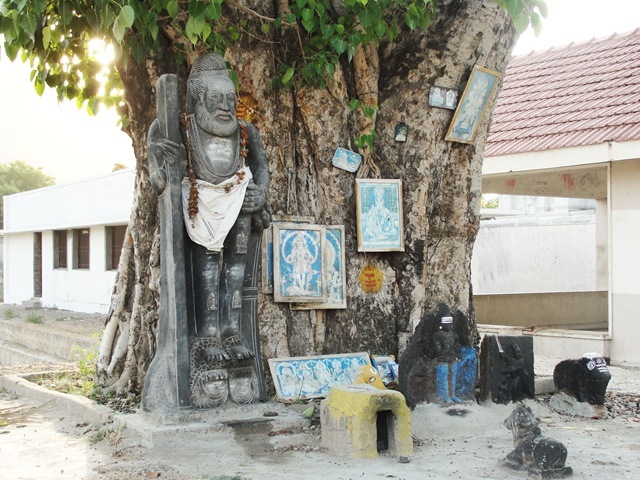 Under this tree, you will see statues of Ganesha and other deities carved in stone. 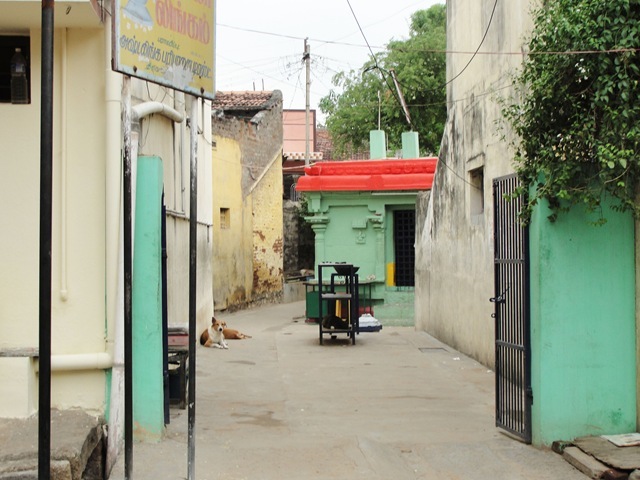 On the left, further down the street is Manakkula Vinayaker Temple, one of the many temples dedicated to Ganesha. (Vinayaker is another name of Ganesha). 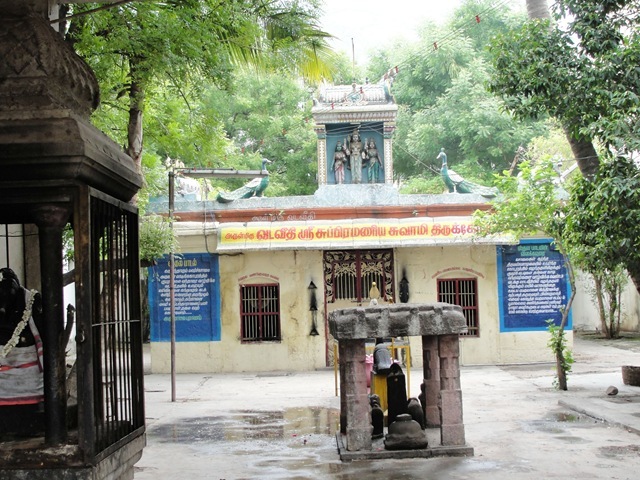 The Vinayaker Temple is historically linked with the Pali Tank. 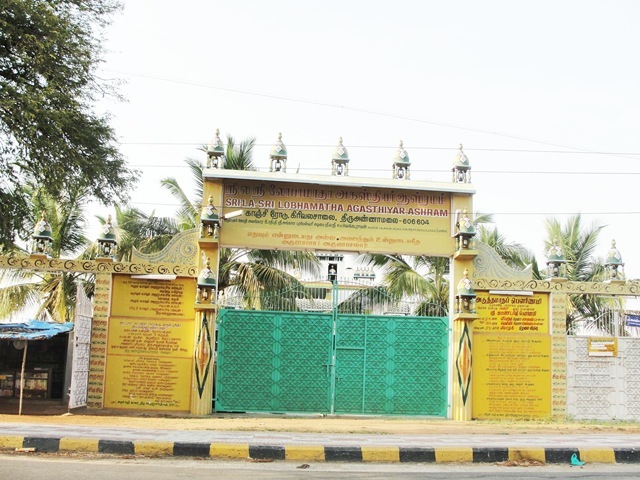 Turning right onto the street at the end of the ashram property, one moves into Palakothu, where today you will find sadhus, and where, in Ramana’s time, devotees such as Sri Muruganar, Ganapathi Muni, and Paul Brunton used to live. 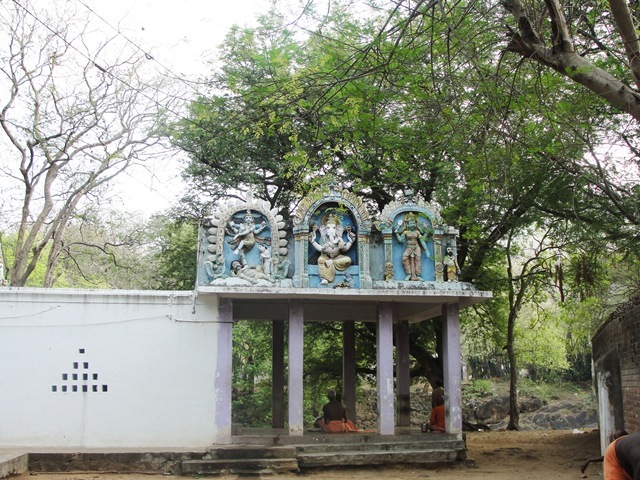 During these days it was a thickly wooded forest, where Ramana often used to go for a walk and visit the sadhus living in Palakothu. 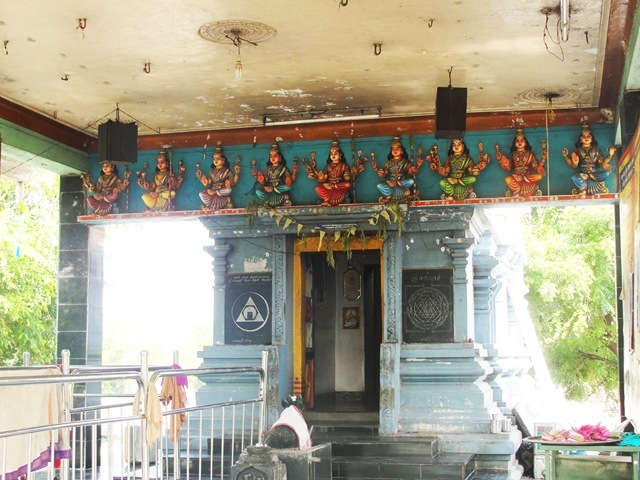 You are greeted by the Kuru Mariamman Shrine. 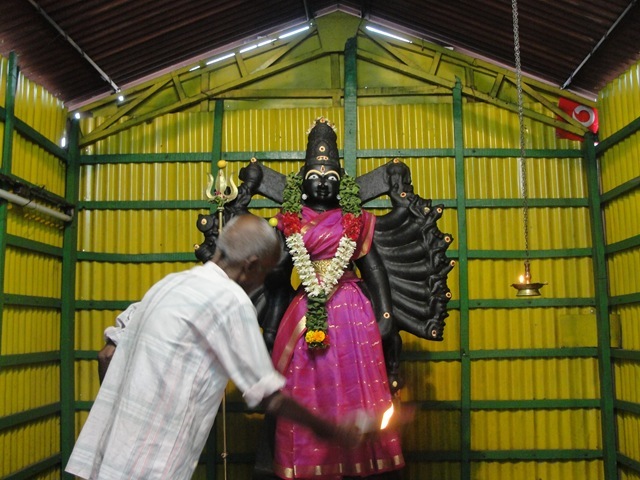 She is the main South Indian mother goddess, predominant in the rural areas of Tamil Nadu, and is associated with fertility, rain and prevention of disease. 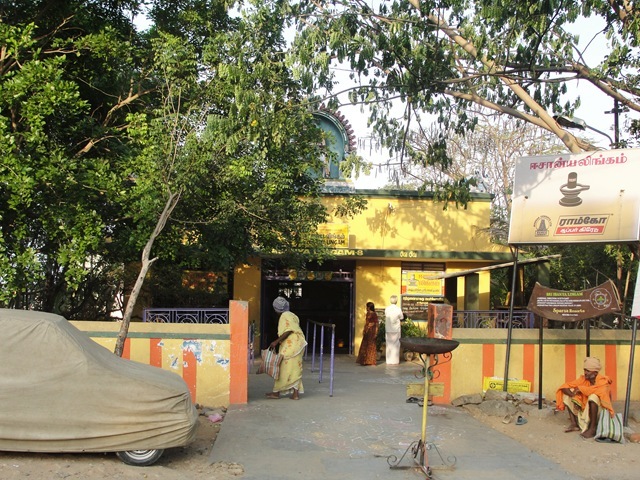 You pass by Vinayaka Temple. This tirtham is dedicated to Agastya Rishi who is one of the seven great Rishis of the cosmic dimension. They are known for their knowledge of the Self. 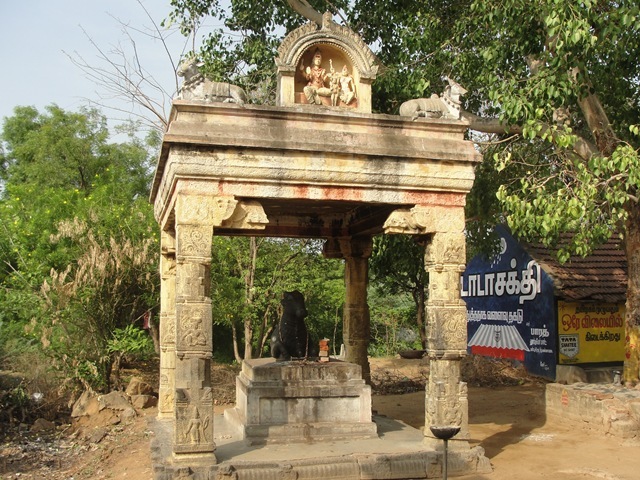 It is said that Lord Siva asked Agastya to teach Tamil grammar to the great saint-poet Nakkirar. When mention was made one day of this tank being called Agastya Tirtham, Bhagavan was asked if that sage ever visited the Hill. Bhagavan remarked “Yes, of course, everyone must come here eventually,” meaning that everyone must eventually return to the source, Arunachala. 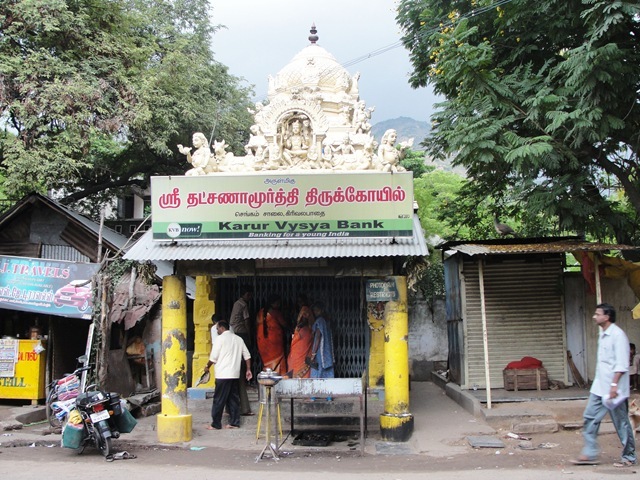 Next to this street is a Devi Temple. Continuing to walk, you arrive at the Peace Park, also called Children’s Park. This can be used as an entrance onto the Inner Path. 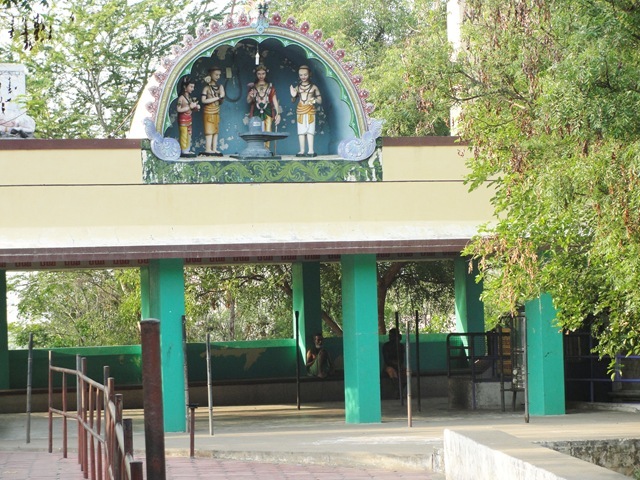 On the grounds of the park is Pandava Tirtham. 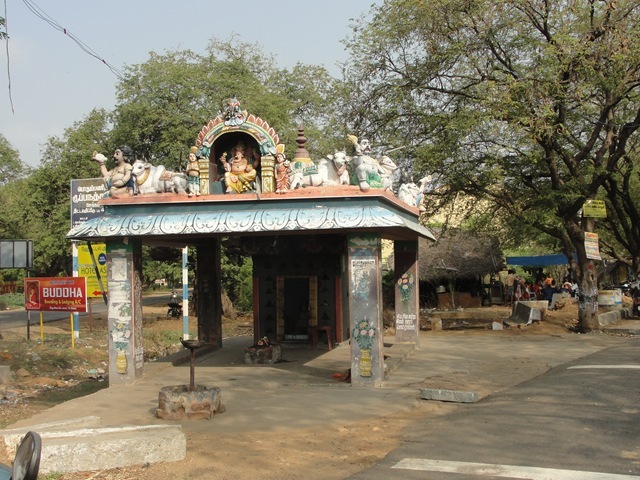 Next to the park grounds is Draupadi Amman Temple (or the Dharmaraja Temple). 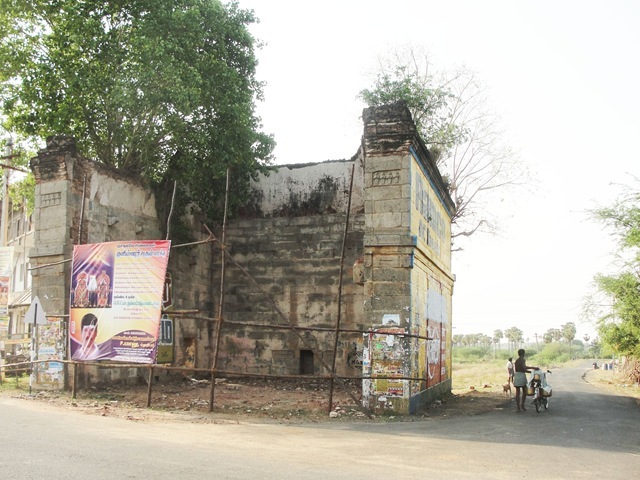 This run down temple has now been partially renovated. Draupadi was the wife of the Pandavas. and Dharmaraja was the eldest of the Pandavas of Mahabharatha epic. A bit further along is one of the entry points to The Inner Path. This is at the intersection of Perumpakkam Road and Bangalore Road (also called Chengam Road). Turn right here and go towards Arunachala about two hundred meters, and turn left onto this path. The path is well marked. Further down Bangalore Road, on the right, is Simha Tirtham. You can see the colorful lion, guarding the tank. 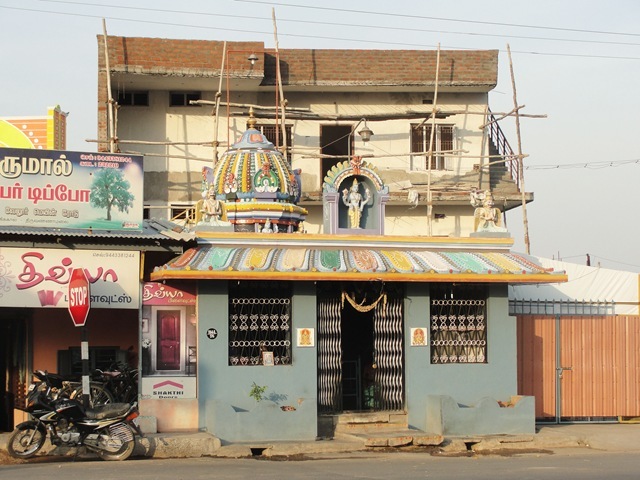 Across the street, on the left, is the Lord Subramanya Shrine. 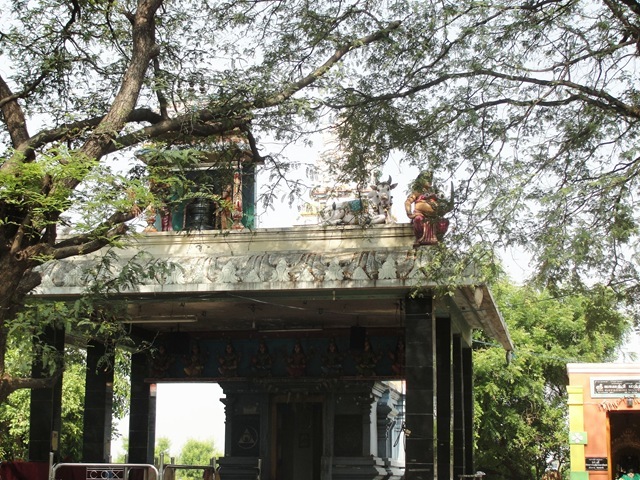 It is a beautiful, peaceful temple framed by an imposing, well-kept mantapam. 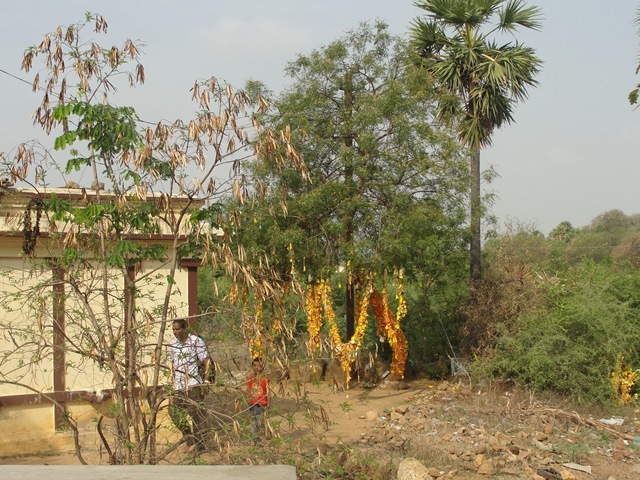 This was the location of a friend’s wedding, shown in the post, Wedding in Tiruvannamalai. Lord Subramanya is a son of Lord Siva. Lord Subramanya (also known as the Jnana Guru) in the aspect of Arumuga (six faces and six pairs of arms), is seated on his mount, the peacock. Skanda, another name for Lord Subramanya, is the personification of the power gained by celibacy. Walk through to arrive at the Lord Subramanya Shrine. 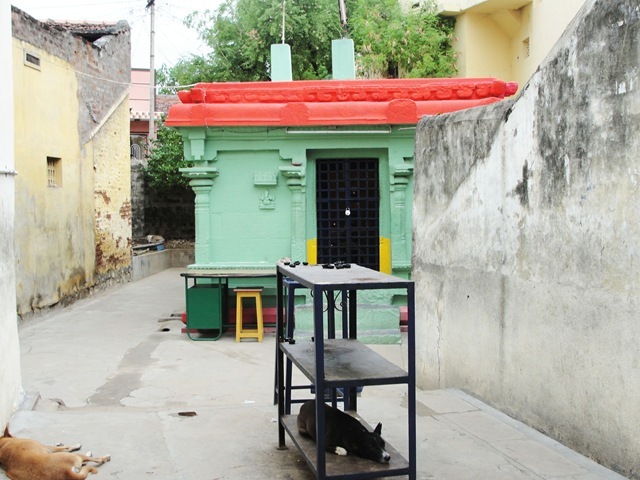 Next, on the right, is a small Rajeshwari Temple. Drivers, leaving on a trip, will stop here and get their cars blessed. 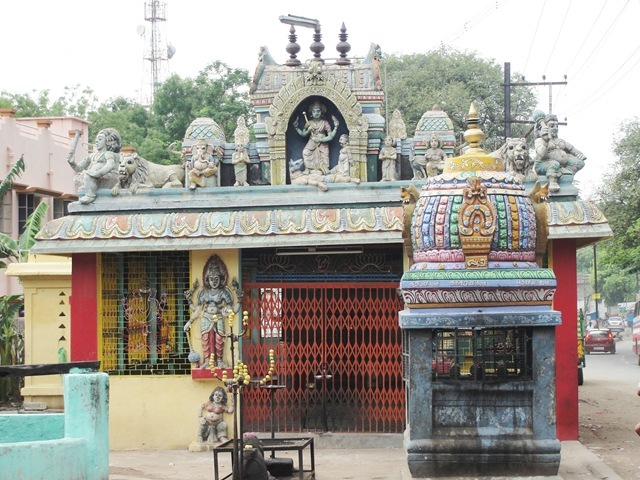 It is a very small temple with small figurines adorning the gopuram (temple tower). 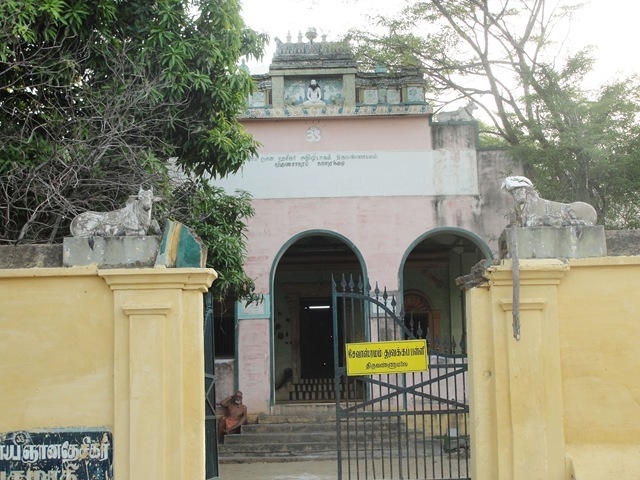 Its architecture reveals it to be very old and of pure Dravidian style. Just inside and on the right, there is a stela (a tall vertical stone) on which the figures of Lord Siva and Parvati, sitting on their mount Nandi, are beautifully sculpted. It is also called Aravan Temple. Aravan is a Siddha Purusha, who is said to have granted all requests made by his devotees. Above us on the left is Idaichi Mantapam, high above us on a rock. Idaichi means shepherdess. At one time, it was shelter for shepherds, as it was an excellent lookout for watching over the flocks. 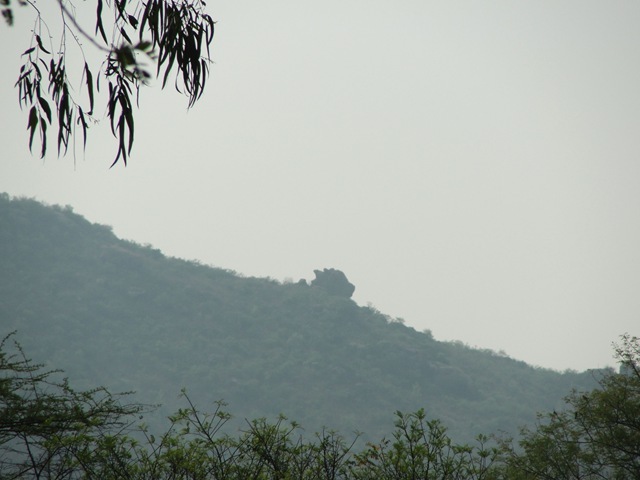 The stones of this hillock are famous as they are used for carving figures of deities. Here is a close up of Idaichi Mantapam. 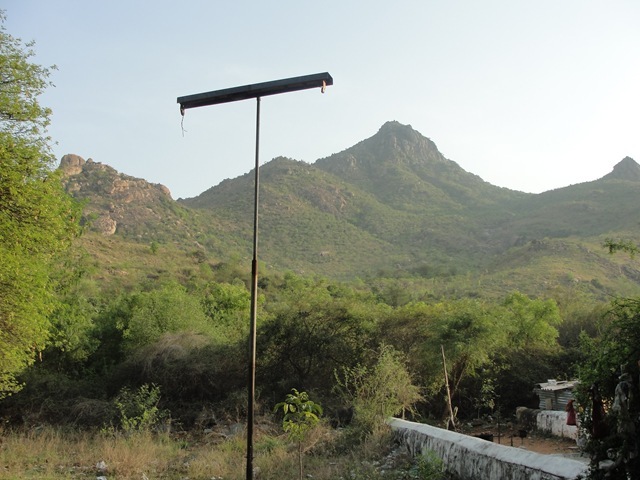 Next, on the left is one of the eight cardinal lingams placed at intervals around Arunachala. This is the Yama Lingam. 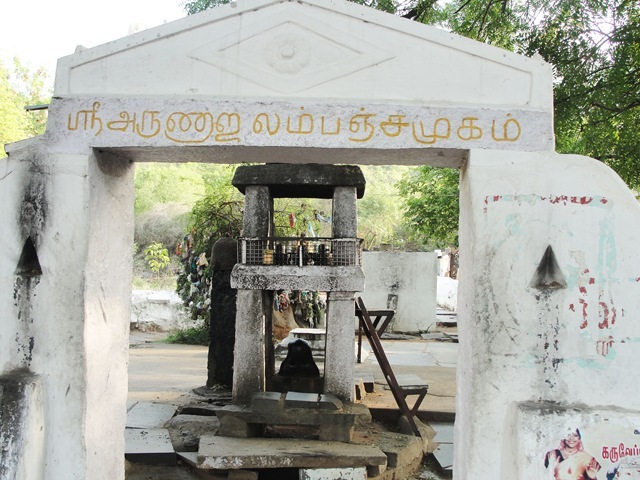 This is the South lingam. Yama is the God of Death, and the guardian of the South. Yama is associated with the death of the ‘I -thought’, the assumed idea that one’s identity is as this body. 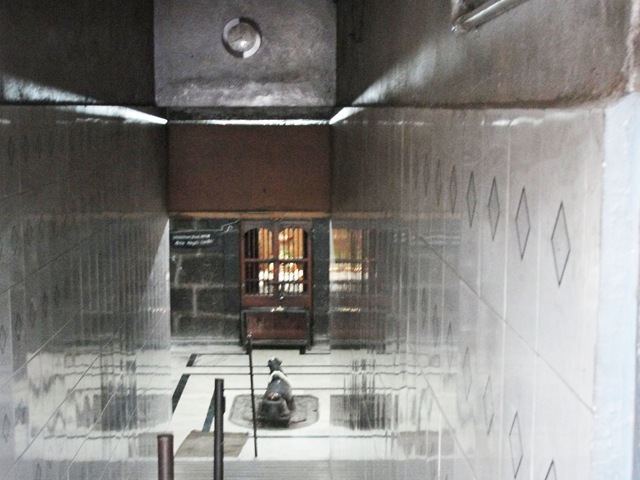 Behind the lingam is Yama Tirtham, said to be dug by Yama, himself. Further along, on the left, is this big Nandi, facing Arunachala. A close up of Nandi. If you want to get a message to Siva, whisper it into Nandi’s ear. 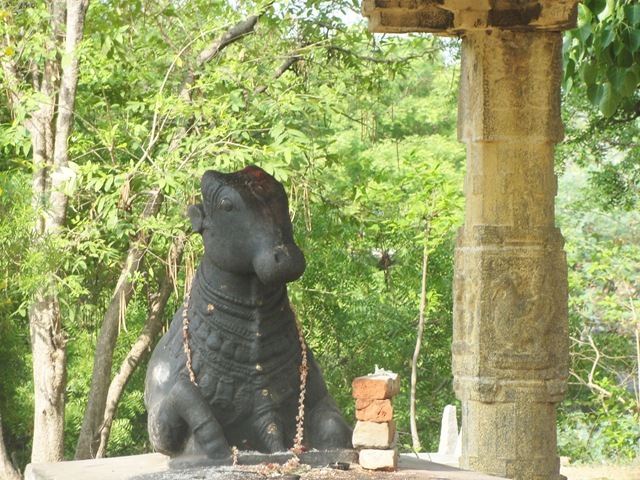 Nandi is Siva’s mount, vahana in Sanskrit. Nandi is Siva’s prime worshipper. Nandi is facing Siva in every Siva temple. You can approach Nandi, but may not be able to approach Siva. 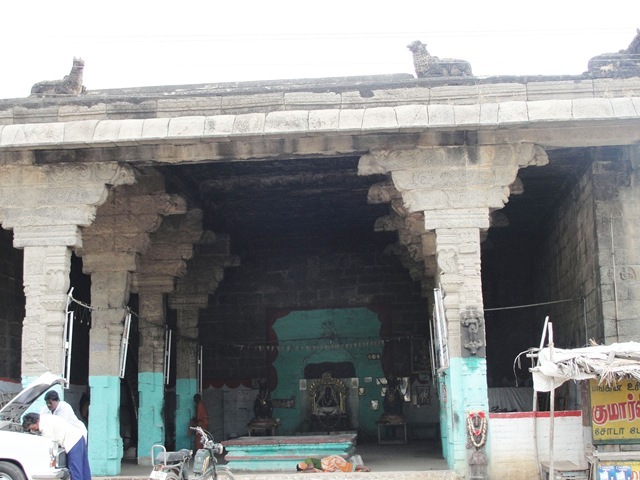 Past Nandi, still on the left, is another Mandapam, pillared hall, presently unused (except for cows you may see laying in it). After this you will turn right onto Girivalam Road (Hill Round Road in English). 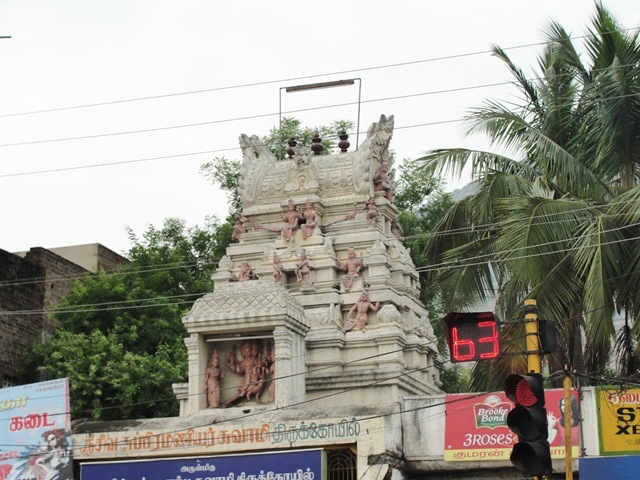 Immediately at the corner, on the left, is Valamuri Ganesha Temple. Usually Ganesha’s trunk curves to the right (as you face Ganesha). Valamurti’s trunk curve the the left. This form of Ganesha brings good luck. Ganesha’s mount is the rat. 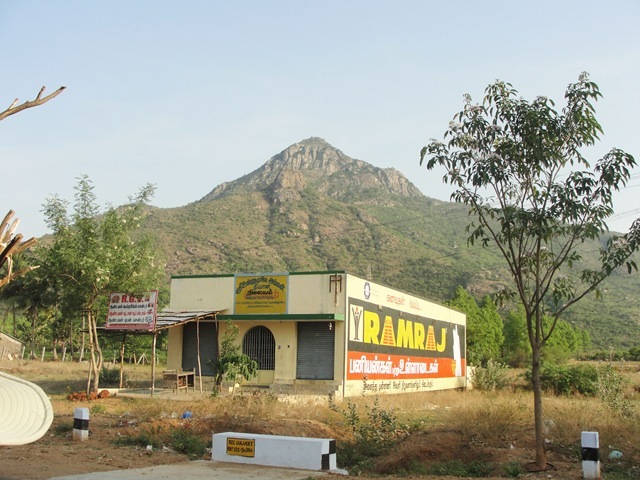 This is the view of Arunachala from the start of Girivalam Road. As one walks pradakshina around Arunachala, one should keep the mind on Arunachala, and notice the many forms that the Holy Hill presents. Next, on the left is another temple. I do not know its name. 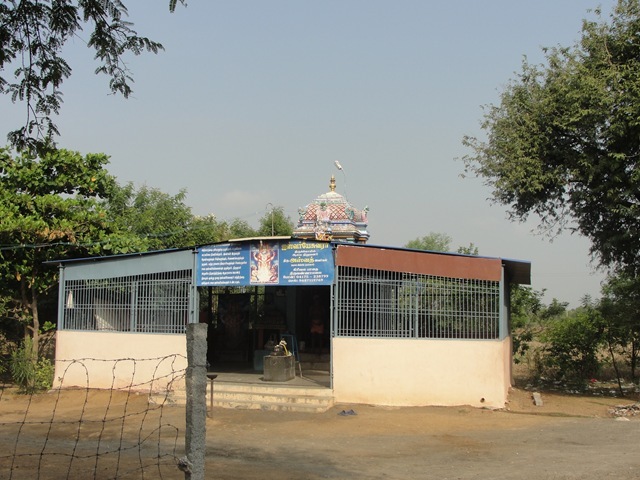 A few hundred metres down the road is the temple of Sage Durvasa. Locally this is known as a women’s temple. 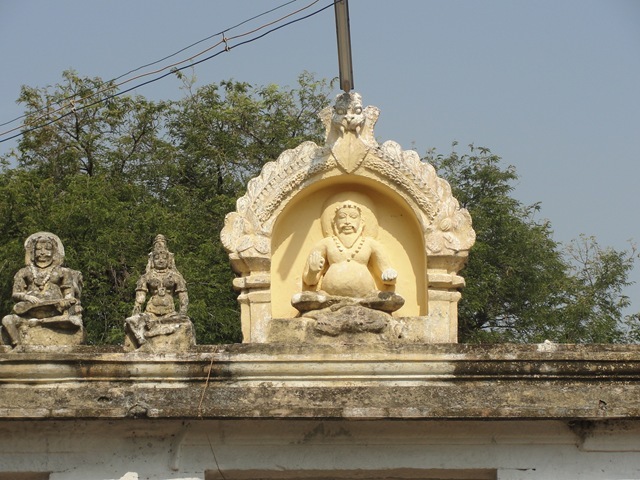 The statue of Durvasa appears seated in padmasana (lotus posture), his legs short, his body stocky; one hand is in abhayamudra (giving protection) and the other in varadamudra (fulfilling wishes), bestowing knowledge to the seeker. He has the reputation for being very meticulous and sensitive to tradition. He punishes those who breach dharma (duty, law). He is known for his short temper. 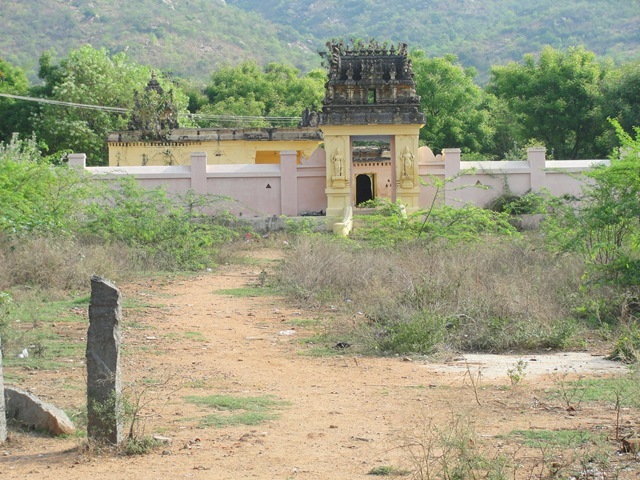 There is a story in Arunachala Puranam that he cursed two Gandharvas (celestial musicians) for trespassing into his ashram garden. 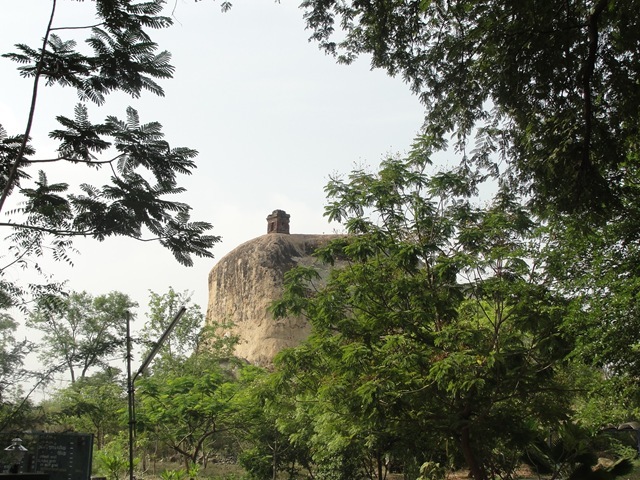 They got over the curse by circumambulating Arunachala. 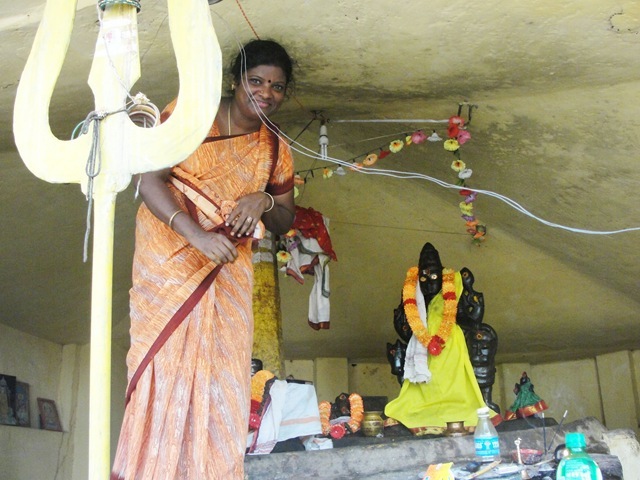 Woman near the temple will offer to sell you ‘wish bags’ to tie to take advantage of Durvasa’s wish fulfillment. Behind it is a tree (a wish fulfilling tree) tied with many wish bags. When your wish is fulfilled you should remove a bag. I don’t think that everybody does this. 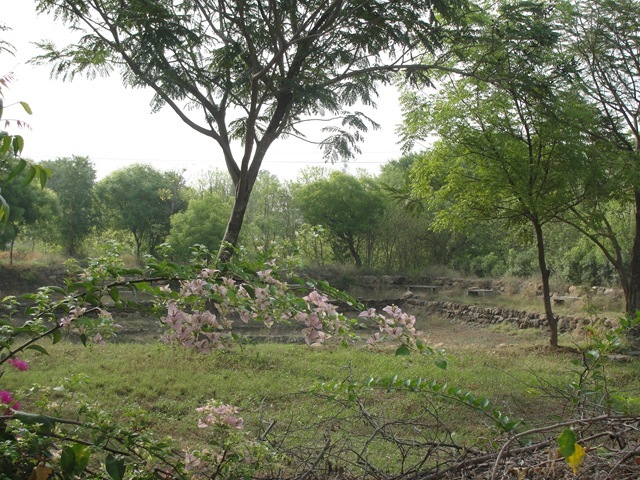 Across the road, on the right, is a path that leads to Kaattu Siva Tank and Hermitage. 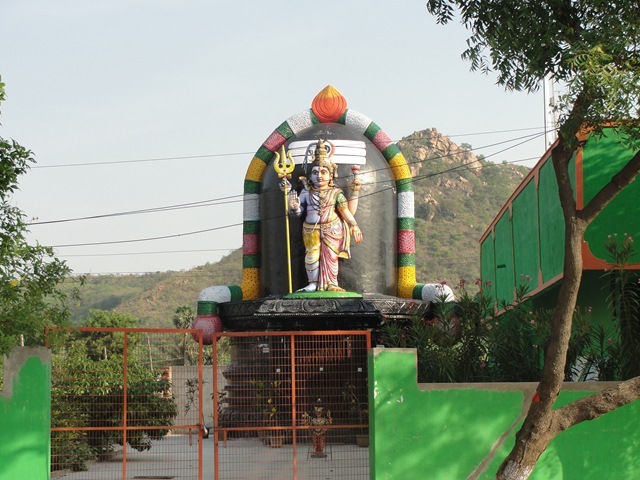 Kaattu means ‘jungle’ in Tamil, so this is ‘Jungle Siva.’ Kaattu Siva lived at the same time as Sri Ramana Maharshi, and was said to be a siddha, one with special powers. This is also an entrance to The Inner Path, and to the new Yellow Path (called by Inner Inner Path by some). In the morning, sadhus can be seen bathing and washing their clothes at Kattu Siva Tank. Here is Arunachala from this point. It was hazy today, so the Arunachala pictures are not as bright as they can be. 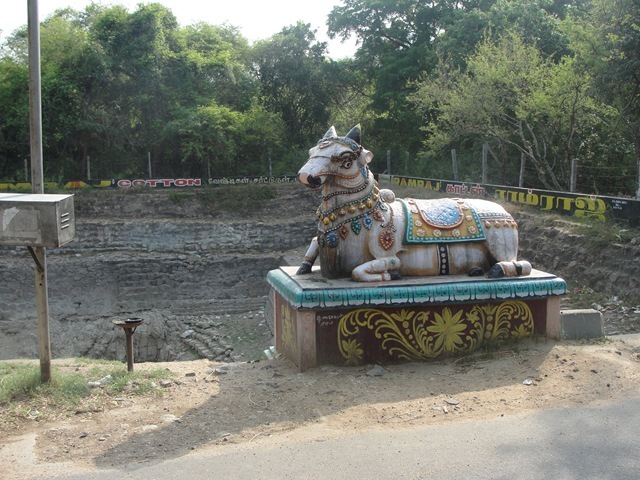 This is the Nandi by the Sona Tirtham, to the right of the road. Next to Nandi is Jyoti Vinayakar Temple. This is in a heavily forested area. 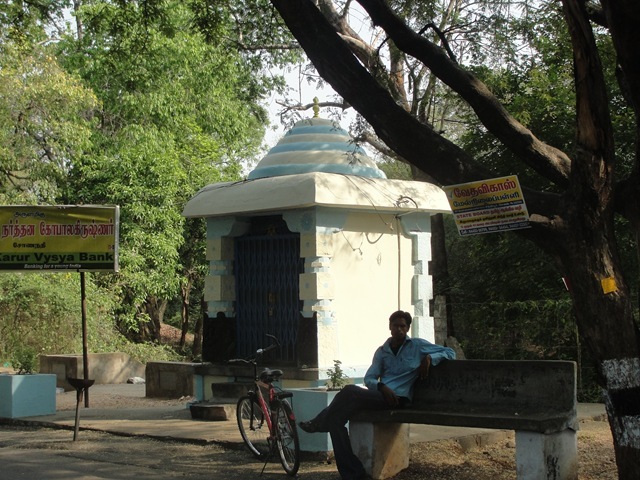 Bhagavan Ramana used to rest for a while at this cool place and often took refreshments here while on Giripradakshina. Down the road, also to the right is a small temple, Kalinga Mardhana Krishna Temple. Across the street is another wish bag place, the Mariyamman Shrine. Wish bags here usually ask for children. Here is the lingam. It is one that shows a face. You can see the eyes in the photo. To the left down the road is the next of the eight lingams, Nirudhi Lingam. Nirudhi is the guardian of the southwest. He is chief of the rakshasas – evil beings. He is domineering and likes the pleasures of this world. He is propitiated to obtain victory in any endeavor. The dog is his attendant. It is on a short street to the left. There usually are many sadhus here. There is a tank here as well. Past this, here is a place were you can view the Nandi on the side of the Holy Hill. It stands out on a ridge to the right from near this spot. 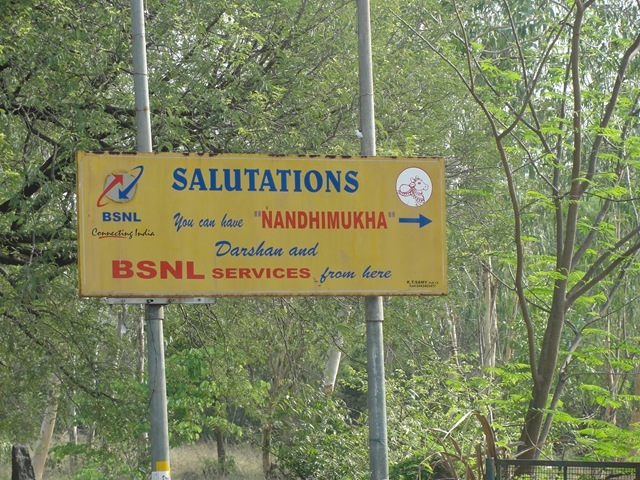 Though there is a sign here, you actually have to walk a bit back up the road to see Nandi. 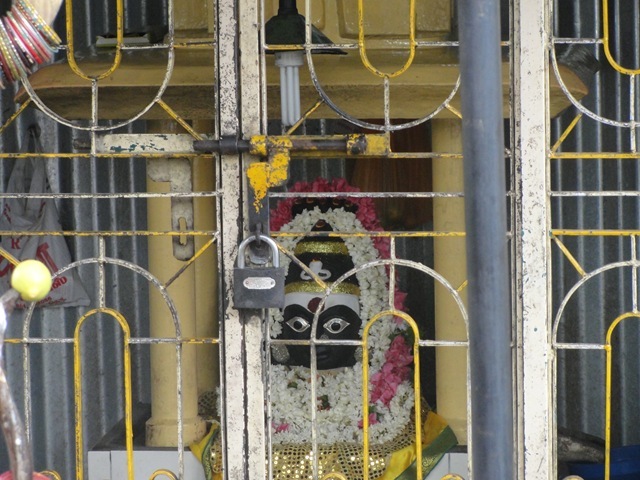 Here is the Nandimukha Darshana. This is a place not in the Guide book, the Nava Lingam. 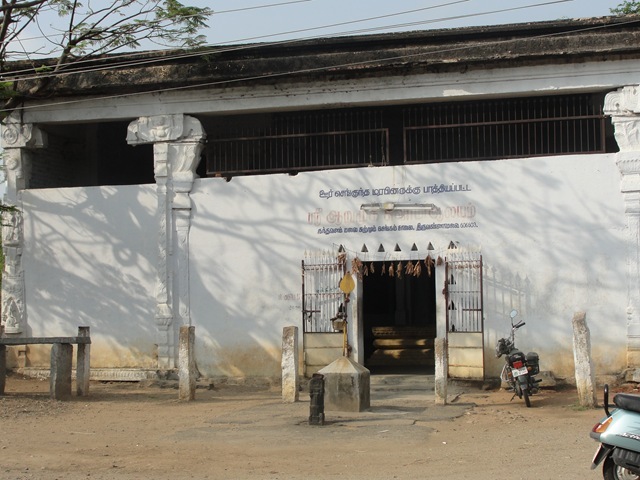 The lingam is inside this building, along with other idols. 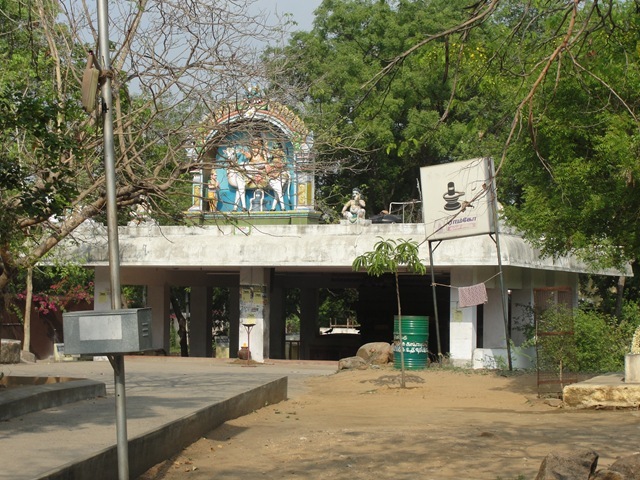 Next to it is Ramalinga Swamy Ashram. 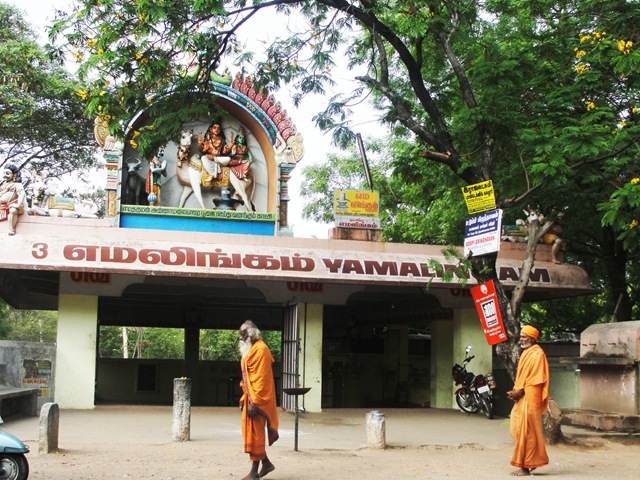 A saint portrayed as white, Ramalinga Swamigal, was popularly known as Vallalar. He is a 19th century Saivite saint known for miracle cures and for thousands of verses breathing universal love and peace, which are all available today as a single six-volume work called ‘Tiru-arut-paa‘, (Holy Poems Sweeter than Nectar). He is shown as white, since it is said that his body never cast a shadow–an extraordinary case of being visible yet transparent. Some of his miracles were reported by the British authorities. 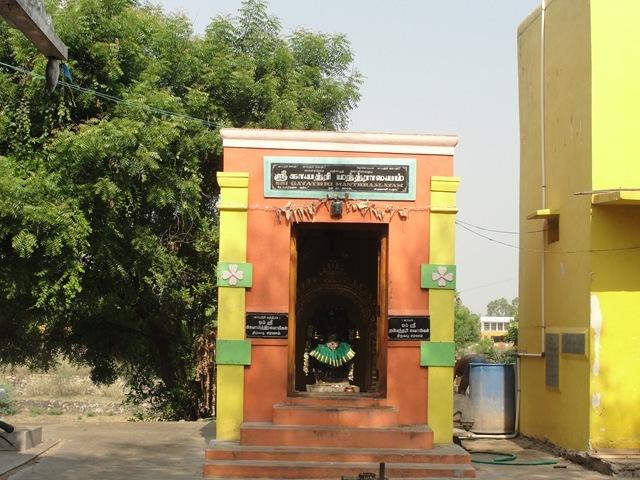 Though he has nothing to do with Arunachala, there are several shrines to him here. This will be his main shrine. It is being rebuilt, in a much bigger and better building. 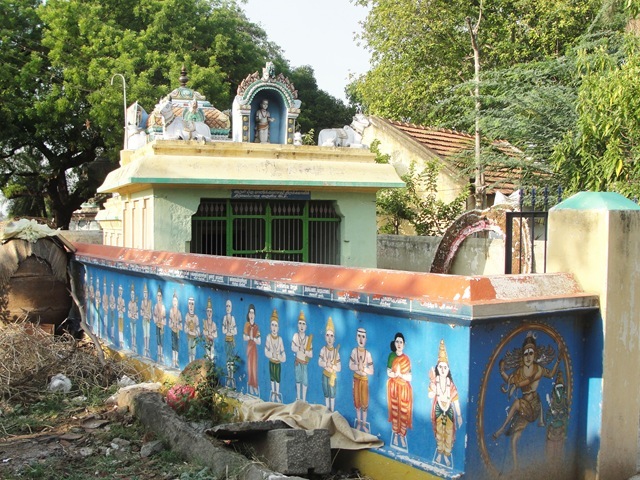 About 150 metres down the street are five temples in a row. First, on the left, is Edirner Annamalai linga. 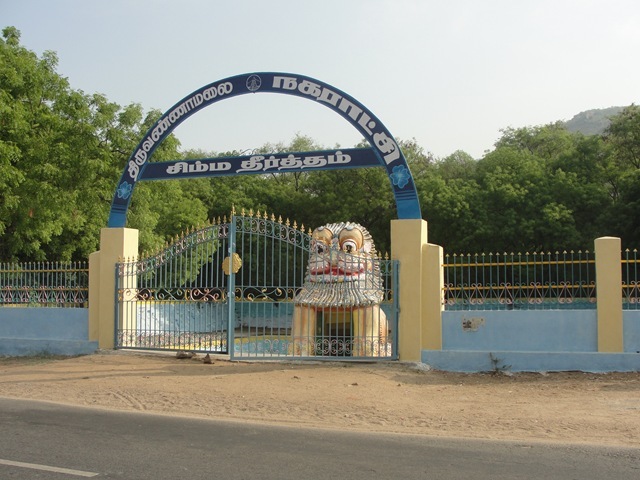 Next to it is Unnamalai Amman Temple. 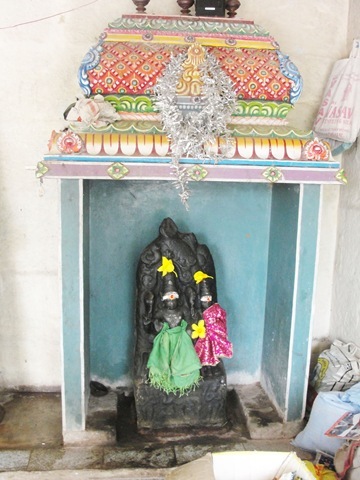 Then is a small Gayatri shrine. She was Brahma’s second consort. The goddess Gāyatrī is considered the veda mata, the mother of all Vedas and also the personification of the all-pervading Parabrahman, the ultimate unchanging reality that lies behind all phenomena. Next are the nine planets, the Navagrahas. The Navagrahas have great importance in Hindu Rituals. They are considered to play a major role in deciding the destiny of man. All the nine grahams – Sun, Moon, Mars, Mercury, Jupiter, Venus, Saturn, Rahu (Snake’s head) and Ketu (Snake’s tail) – give us pleasure and serenity and remove obstacles from our way. 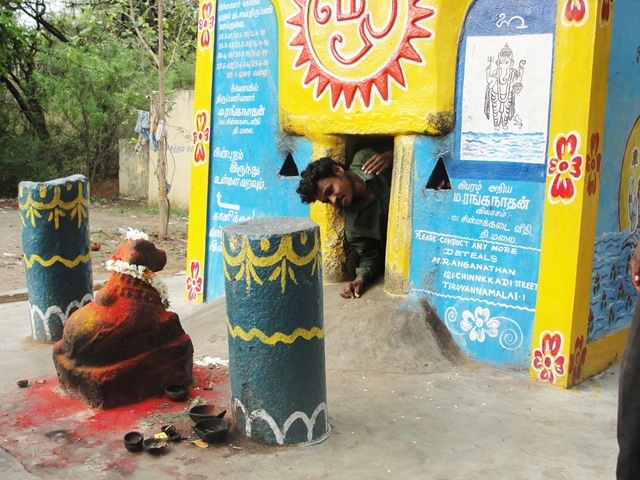 Navagrahas are in many Hindu temples. Across the street is the Hanuman Temple. 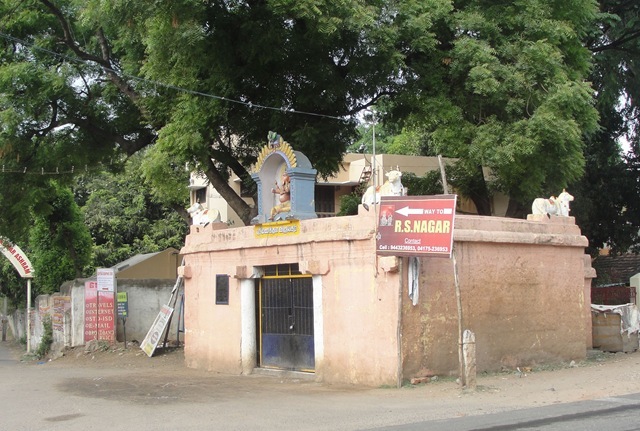 A devotee of Sri Ramana Maharshi built this temple. Hanuman, the monkey god, is the son of Vayu, the wind god, and Anjana. He is a great bhakta of Sri Rama and played a major role in liberating Sri Rama’s consort, Sita, from Ravana in Sri Lanka, according to the epic Ramayana. It is written in the Skanda Purana that when Sri Rama asked Hanuman to bring a medicinal herb called Sanjivini from Mount Dunagiri a.k.a Mahodaya in the Himalayas to revive his unconscious brother Lakshmana, Hanuman could not find that herb so he lifted the whole Hill and flew to Sri Lanka. 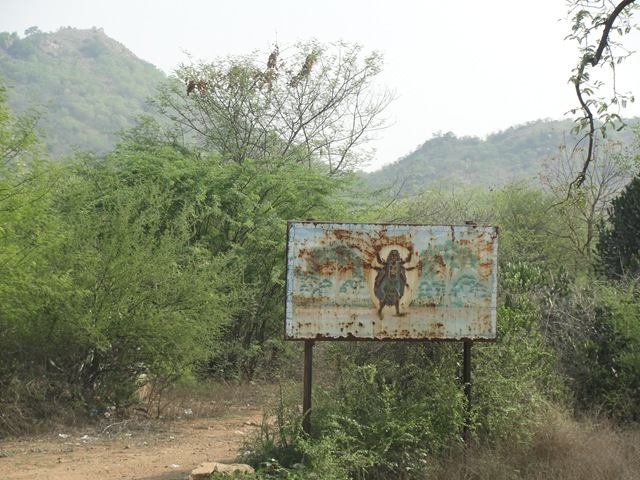 As he was flying over Arunachala, a piece of the Hill, along with its medicinal plants, fell on Arunachala. So there are a great variety of medicinal plants all around the Hill, whose scents, wafted by breeze, are beneficial to health. 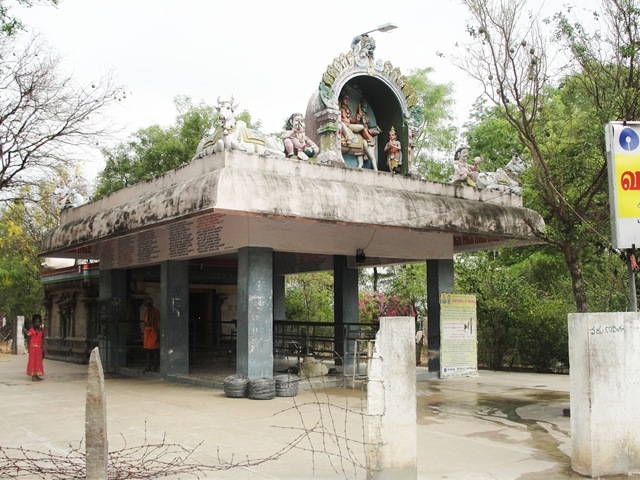 Next to the Hanuman Temple is a shrine to Sri Raghavendra Swami, a 16th century Hindu saint who advocated Vaishnavism (worship of Vishnu as the supreme God) and Sri Madhvacharya’s Dvaita philosophy. This is one of the few Vaishnivite shines along the way. 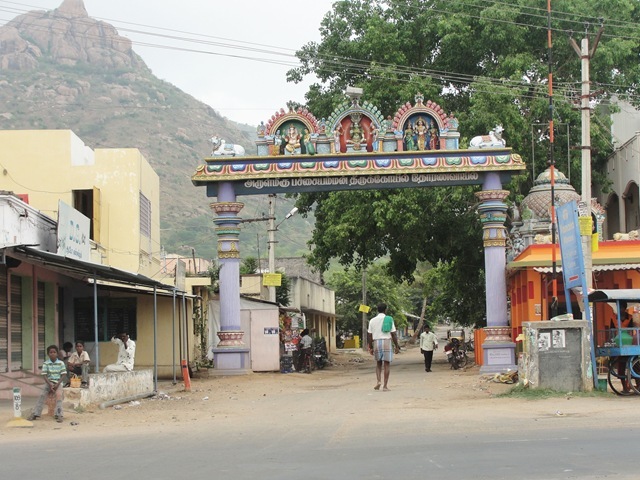 Down the road, on the left is the Lord Palani Temple. 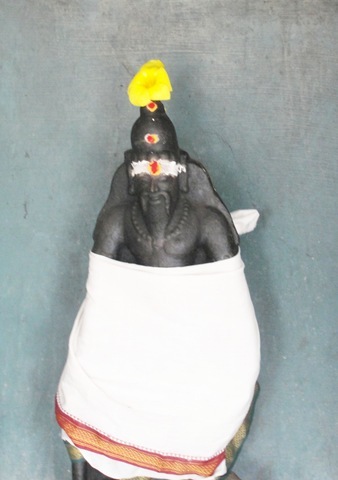 Lord Palani is a form of Murugan, Siva’s second son, brother to Ganesha. Here are idols in this temple. To the right is the last entrance to The Inner Path. This also goes to Kannapar Temple. Across the street is the entrance to Aham Road. Our house is down this street. 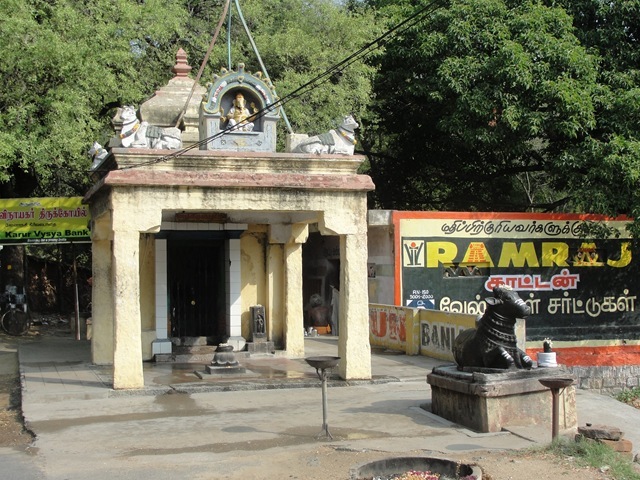 Next to Aham Road is the Raja Rajeshwara Temple. This is another name for Parvati. Nine statues are in the temple, depicting various appearances of the deity. From here Arunachala is almost obscured by Parvati Hill. 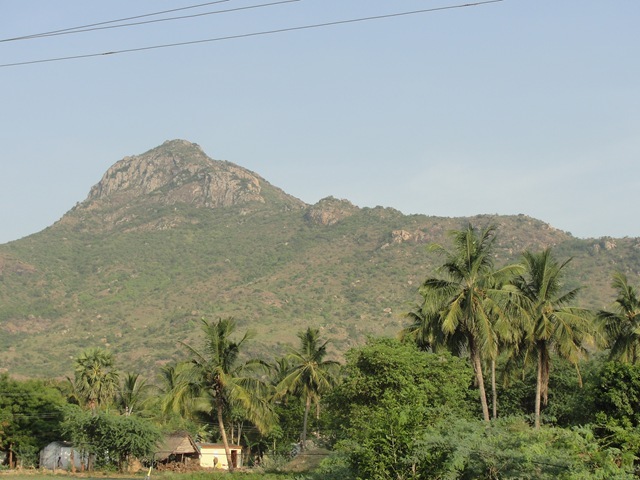 Parvati Hill is the west-most extension of Arunachala. 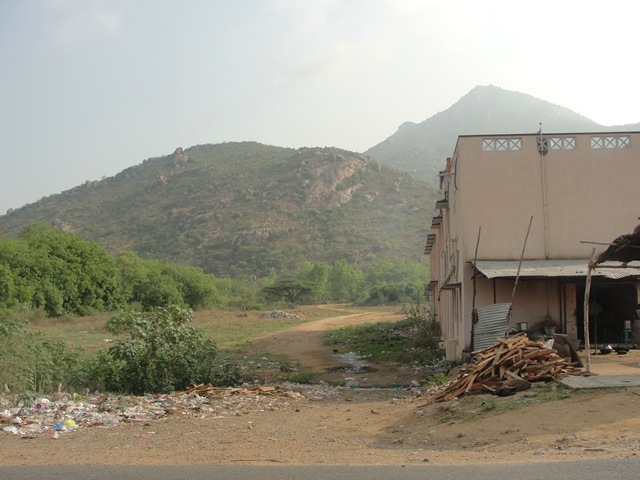 Near here is a place where Parvati HIll completely blocks the view of Arunachala. For this reason, some consider this hill to be the ego, which obscures our vision of the real Self. 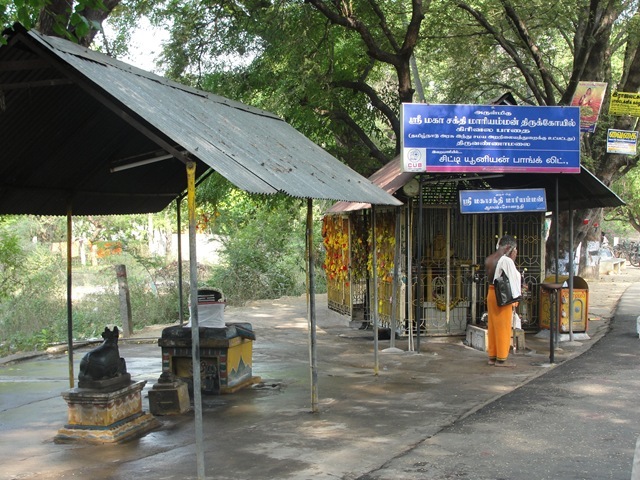 On the left down the road is another lingam in a small mantapam, and a lion shrine. Further down the road, again to the left is Gautama Rishi Temple. Gautama Rishi is one of seven great cosmic Rishis. 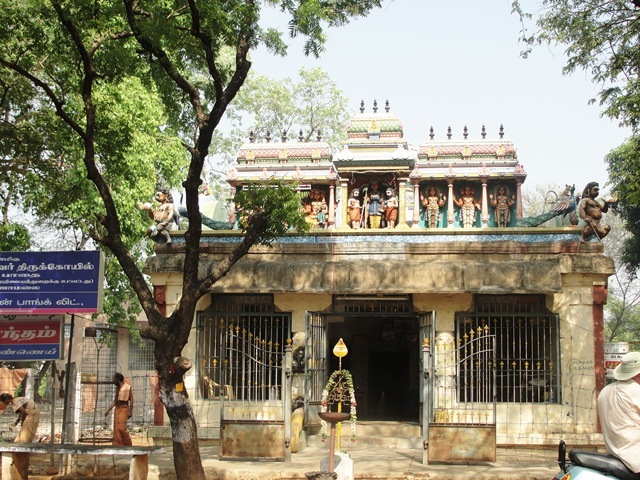 He is a regional Rishi of Tiruvannamalai and of Sri Ramana’s birthplace. Ramana mentions this Rishi in one of his verses. In a chamber attached to the mantapam is the magnificent statue of Gauthama sitting in padmasana ( lotus posture). 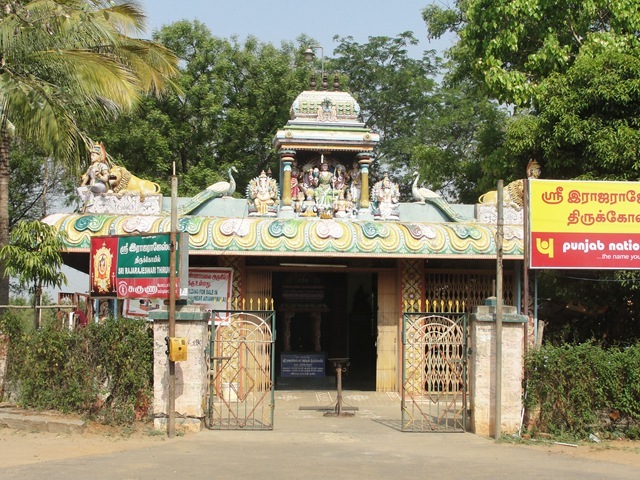 Bhagavan Ramana used to rest for a while at the Gauthama Rishi Temple during his Giripradakshina days. Many times Bhagavan’s Pradakshina party cooked food and had their meal here. Following, on the left, is the Surya Lingam. Surya is the Sun God. There is a story that Surya tried to cross over Arunachala and lost the splendor of his brightness. 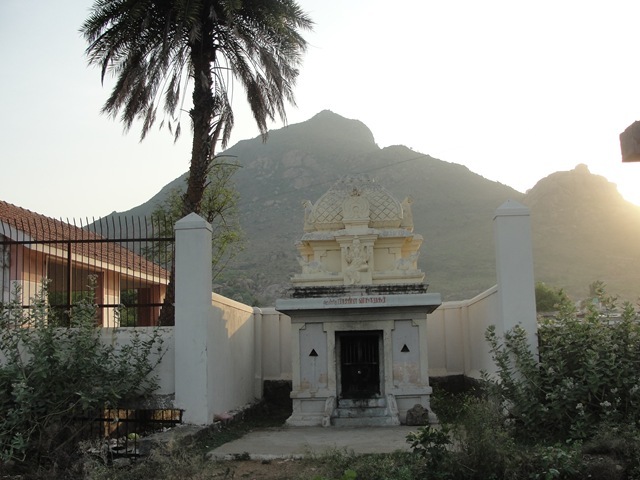 After Surya worshipped Arunachala here, he regained his luster and his brightness. From that time onwards, Skanda Purana says that Surya, while moving from east to west during the course of the day, never crosses over the peak but only over the slopes. 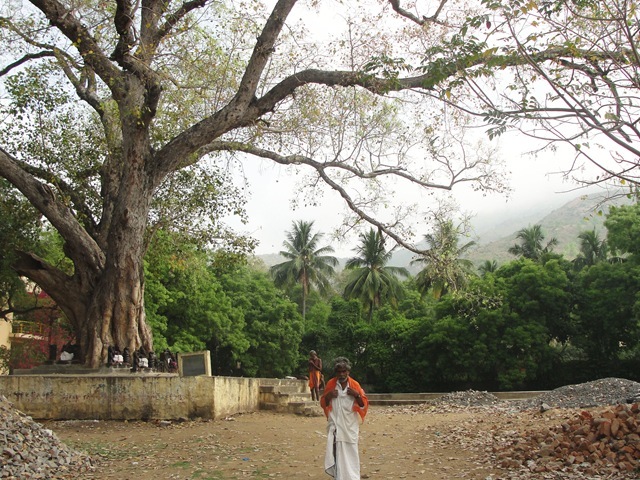 Walk through the mantapam to get to the lingam. 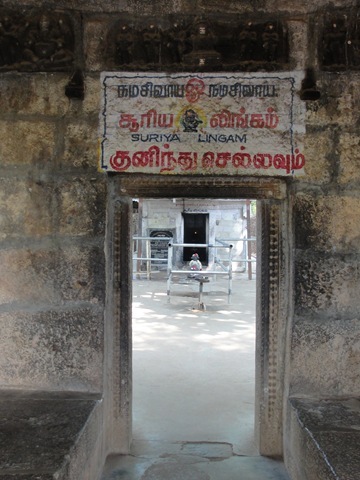 Surya Tirtham is next to the lingam. 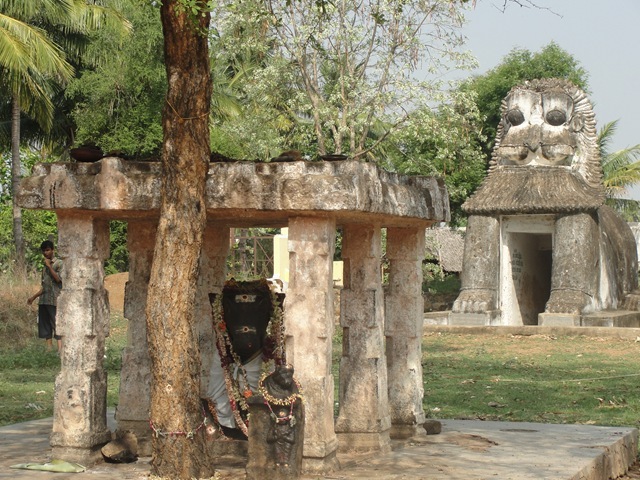 Down the road, to the left is one of several Shakti shrines, formed around termite mounds. These are considered to be places of great power (Shakti). 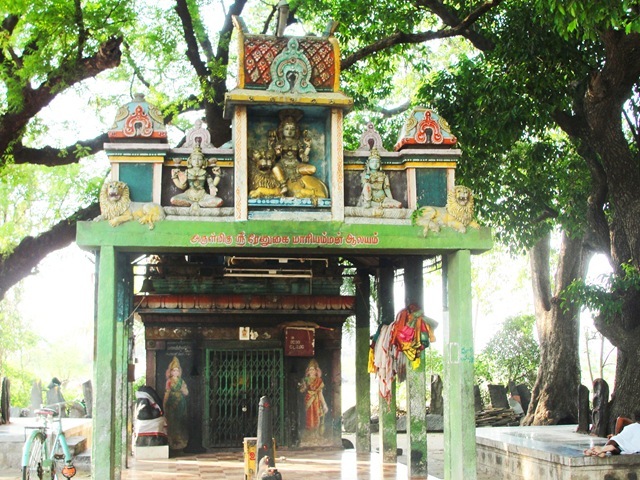 Next, to the left, is the Vishnu Paadam feet Temple. 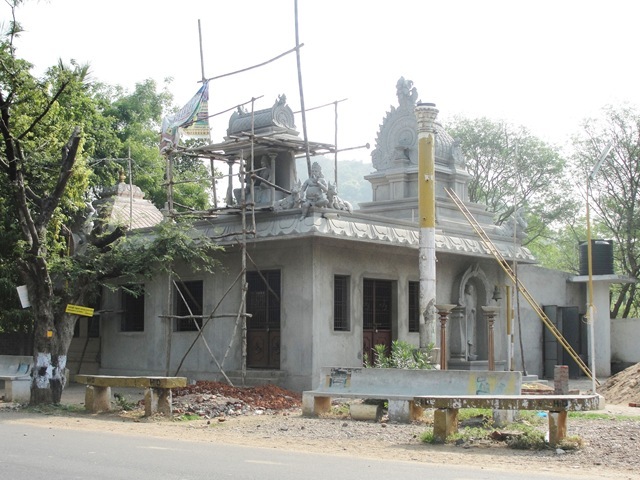 This is a newly constructed temple of Sri Rama. 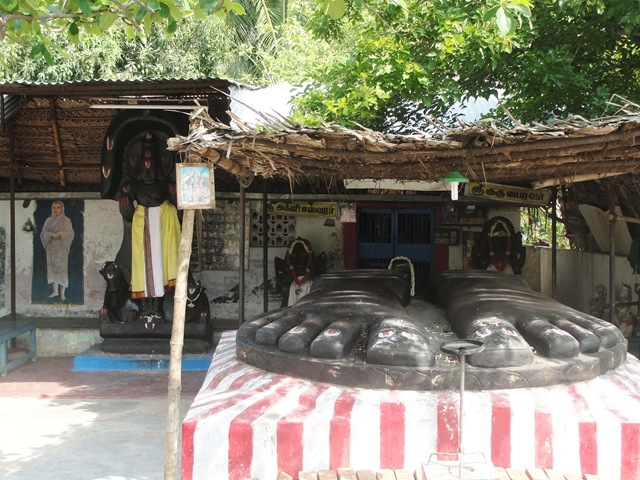 The feet usually face a god in a temple. Here they face Arunachala. The Elephant can now be seen on the north side of Arunachala. The peak forms the head, and the ‘knob’ is the end of the trunk. 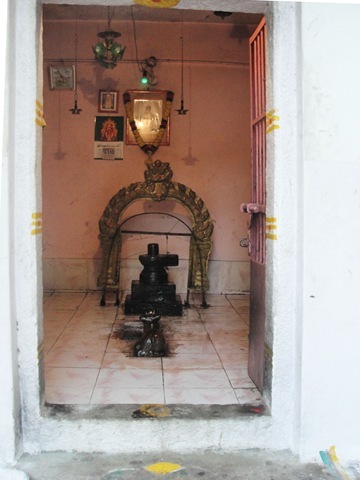 Half a kilometer from the Vishnu Paadam feet Temple is the Varuna Lingam. 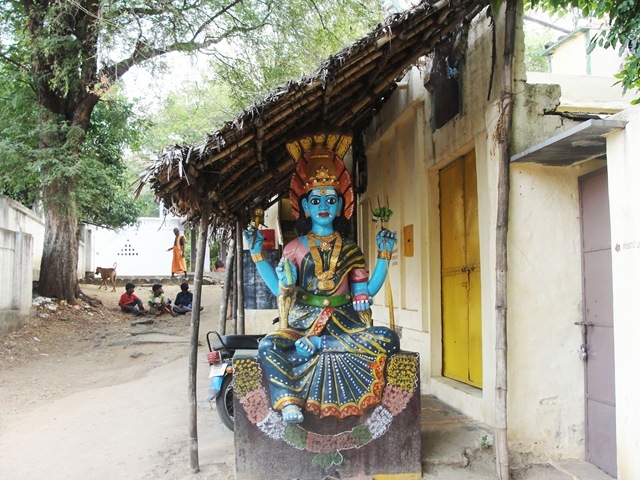 Varuna is the guardian of the west and the lord who dispenses the celestial water as life-giving rain. Together with Indra, he gathers the clouds and the rain. He is the master of destiny and guardian of all rituals. His consort is Varuni and his mount is the king of fishes. The snare is his weapon. Arunachala from this vantage. Parvati Hill is to the right, the peak to the left. 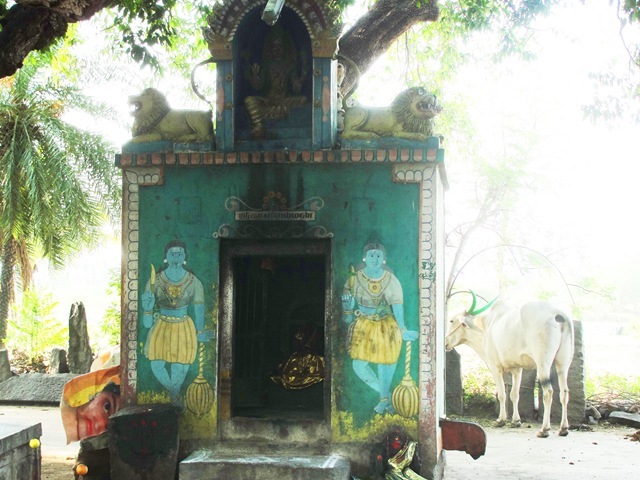 This is a shrine to Ardhanariswara, the form where Siva and Parvati are merged into one god. 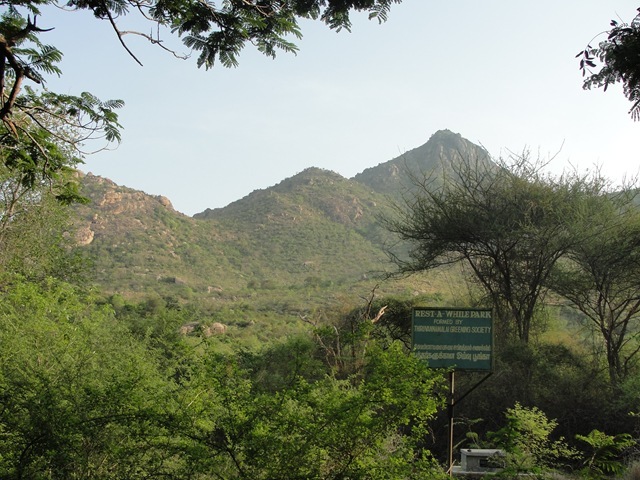 On the other side of Arunachala, Pavalukkundru is the location where this is said to have happened. Next you come to the town of Adi Annamalai. 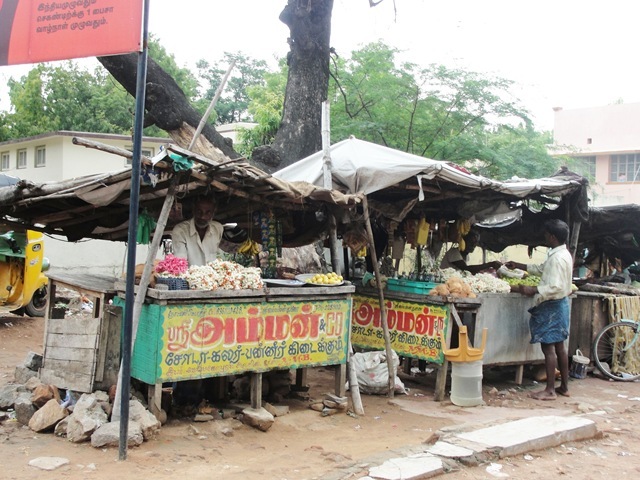 Turning to the right and following the signs you get to Adi Annamalai Temple. The big temple, Arunachaleswara Temple, is said to be 2000 years old. 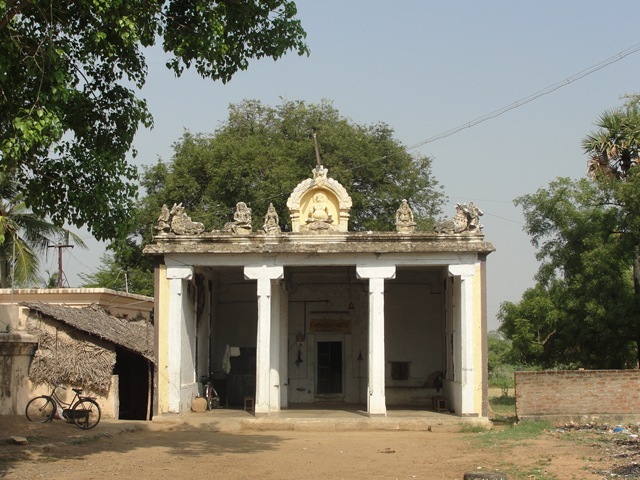 ‘Adi’ means ‘first’, so this temple is the older of the two, most ancient. 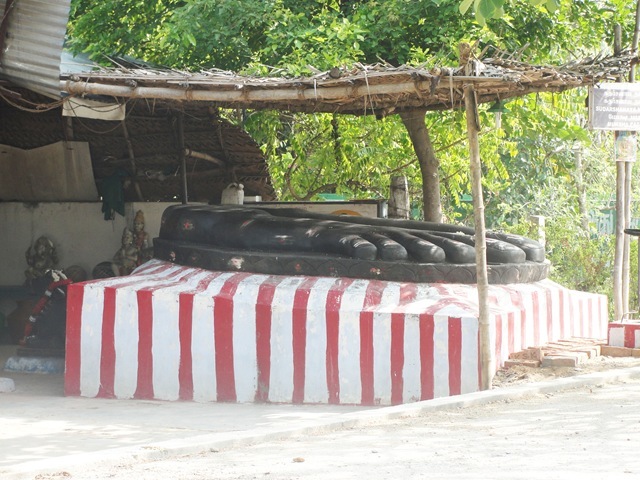 Sometimes Bhagavan Ramana used to spend the nights here while going around the Hill. On one such occasion, he heard celestial beings chanting the Sama Veda in this temple. Knowledgeable people have said that there is a tunnel running right through the Hill from east to west. 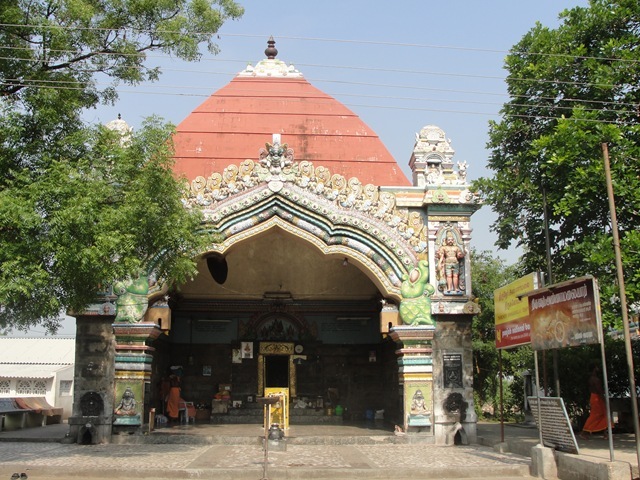 One end of the tunnel opens inside the strong room of the main Arunachaleshwara Temple in the northeast side of the second prakara (corridor). This room is permanently closed and locked. The other end of the tunnel is in the Adi Annamalai Temple premises on the other side of the Hill. 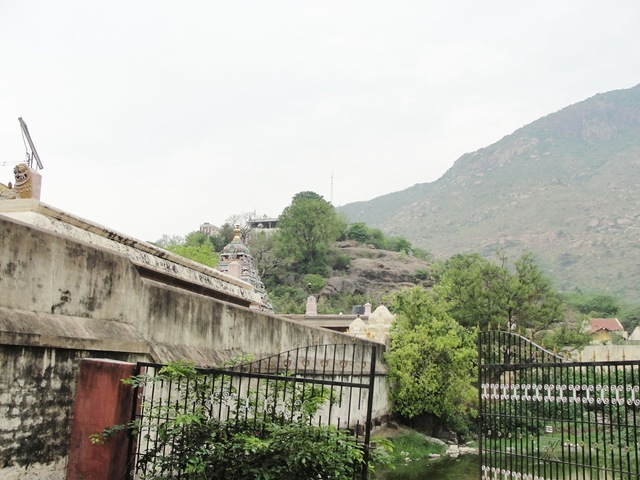 The tunnel is said to provide access to the caves inside the Hill where many yogis and siddhas are immersed in the bliss of union with Arunachala. 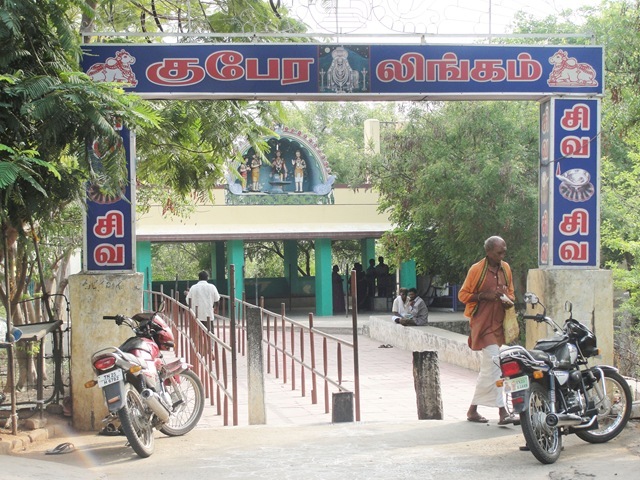 Bhagavan Ramana advised that the opening at the Adi Annamalai Temple side be closed, probably to stop the uninitiated and the curious from entering the tunnel. Temple renovations in 1994 revealed a tunnel entrance. The entrance to the tunnel was permanently closed. Now nobody knows where the tunnel is. 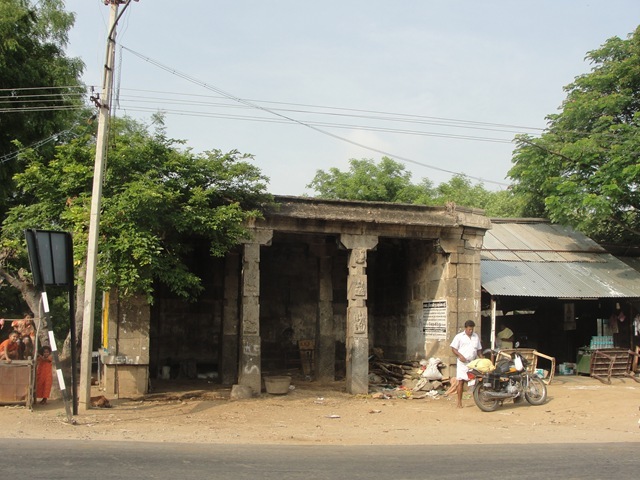 On the street out from Adi Annamalai Temple, is Manikkavachakar Temple. 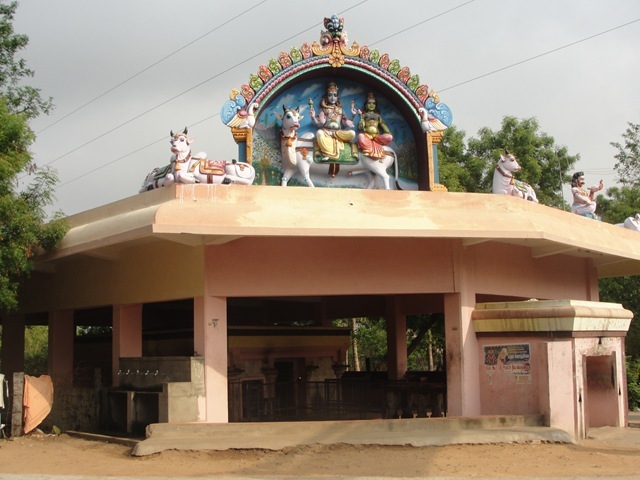 Manikkavachakar is a saint from the Pandya period, known for his devotion to Siva. His story as told by Sri Ramana Maharshi can be found here. 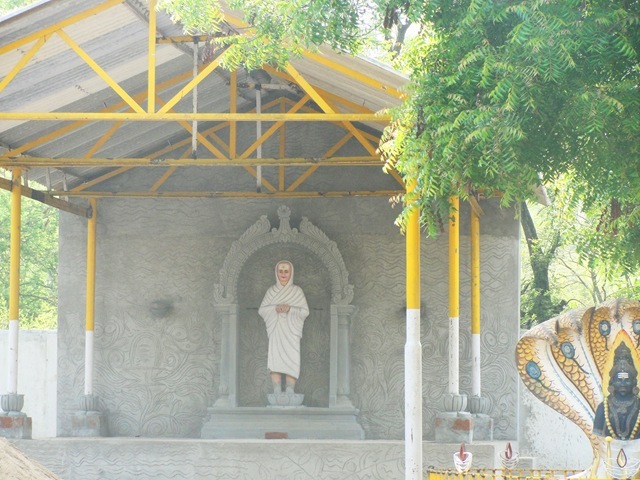 He was one of the four great founding saints of South Indian Saivism. 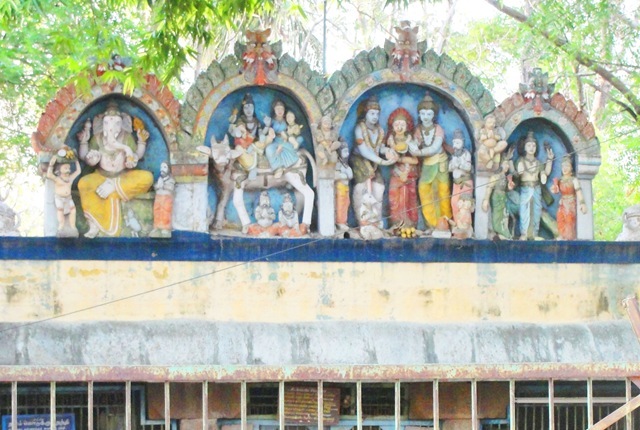 Across the street, on the left side of Girivalam Road, is another Ganesha temple. 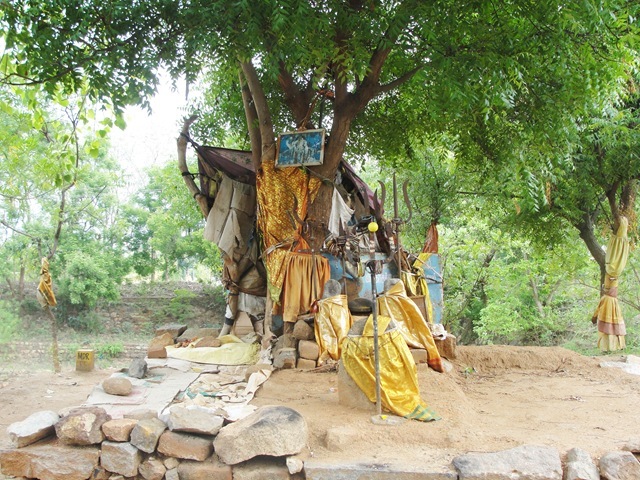 Next to it is the Grama Devate Shrine, a village deity. She is another form of Mariyamman, the ‘smallpox goddess’. the protector from plagues. 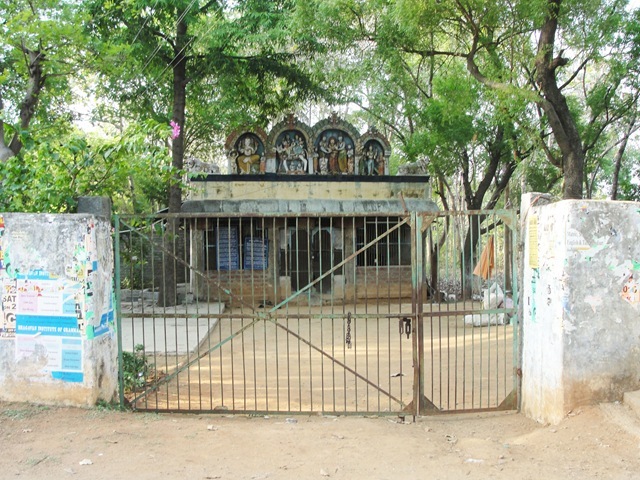 Next to it is this temple. I am not sure to whom. 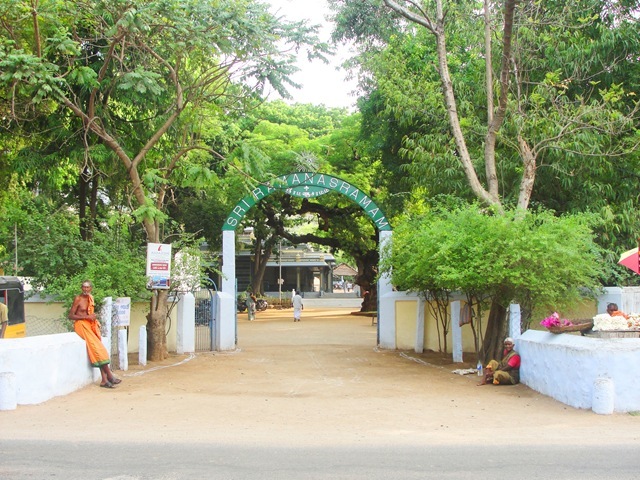 Down the road, to the right, is the Entrance to Suddhananda Ashram. He is a living teacher, steeped in Advaita Vedanta. On the right, another brightly decorated Shakti shrine. 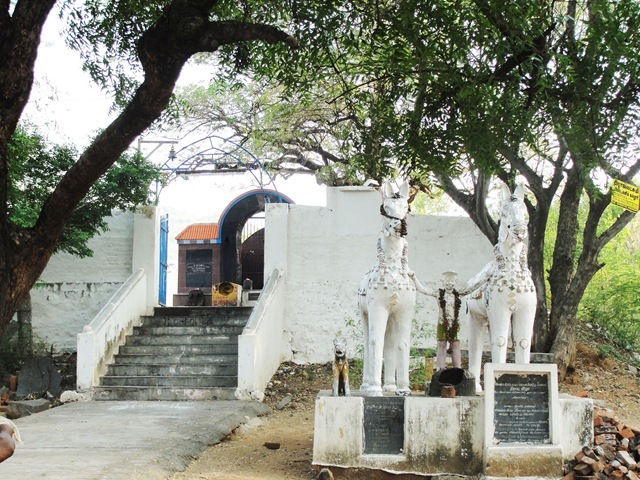 Further along, also on the right is this Vediyappan Shrine, with the two white horses, ready to be ridden to right a wrong. 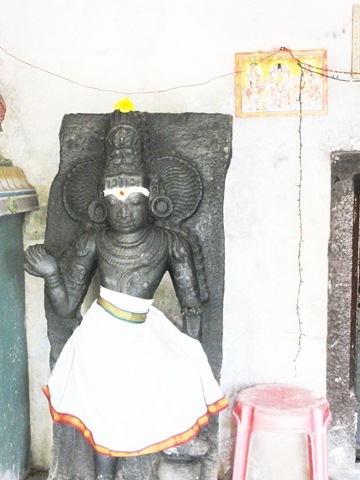 Vediyappan is a village protector, common in South India. Then, on the left, we come to Vayu Lingam. Vayu is the guardian of the northwest, the lord of the air. He symbolizes jnana, the knowledge of the Self. He is the driving force behind all action. 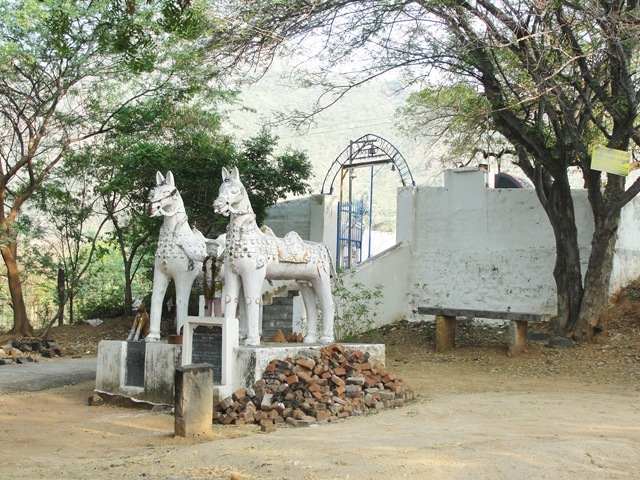 Further down the road is the location where Bhagavan’s Bridge once stood. 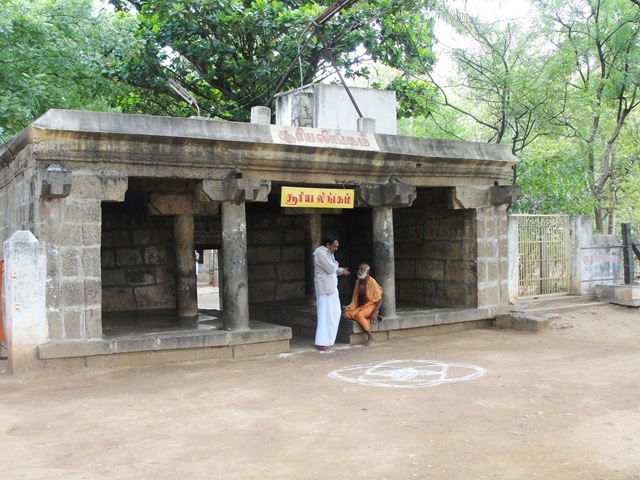 This is another location where Sri Ramana Maharshi would stop and sit during Pradakshina. After Bhagavan’s Bridge, you pass by the intersection of Kanji Road. Past this, on the left, is Eluthu Mantapam which is also known as Ezhuthu and Vettavalam Zamindar Mantapam. This is now a dilapidated structure. Only twenty years ago, the roof was intact and pilgrims could rest inside its spacious quarters. 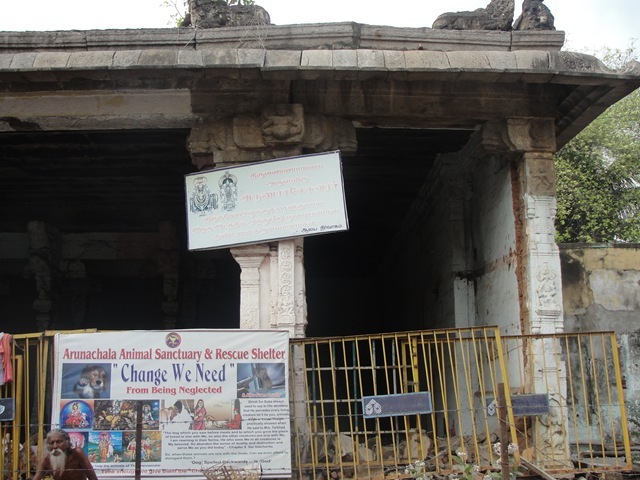 It is sad to see this ancient structure, which has served devotees and pilgrims down through the centuries, in such a decrepit condition today. Here is Arunachala from this point of view. 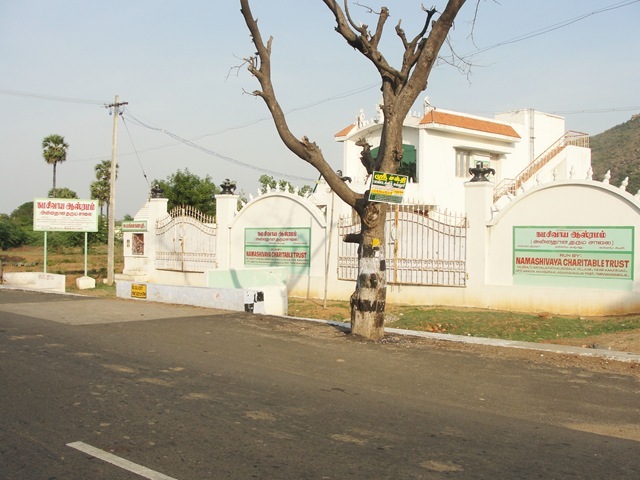 Next, on the left, is Agastya Lopamudra Ashram. Further along, again on the left, is the Sapta Kannika Shrine. 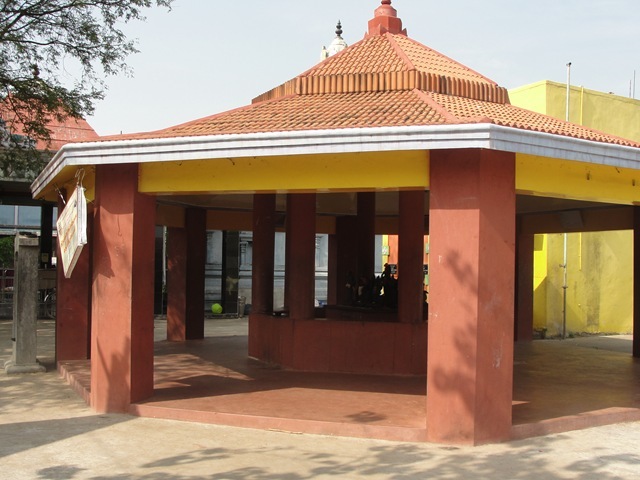 This shrine of the seven sisters of Mariyamman represents the seven aspects of Shakti. Sadly, it has fallen into disrepair and is no longer accessible. 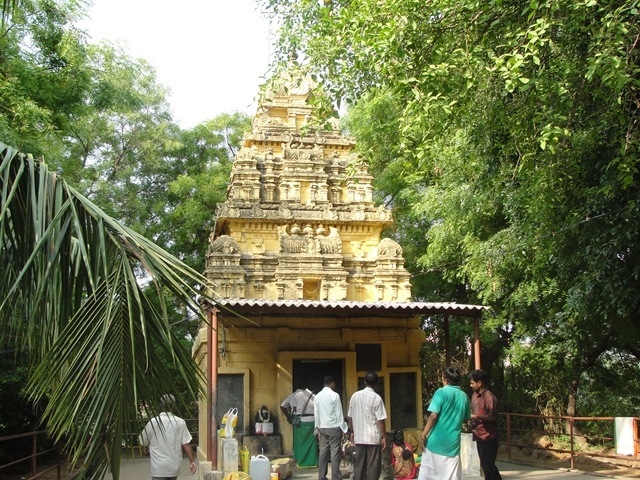 Then, still on the left is the Kubera Lingam, also called the ‘Diamond Lingam.’ Kubera is the guardian of the north. He is the guardian of treasure, both earthly and celestial. 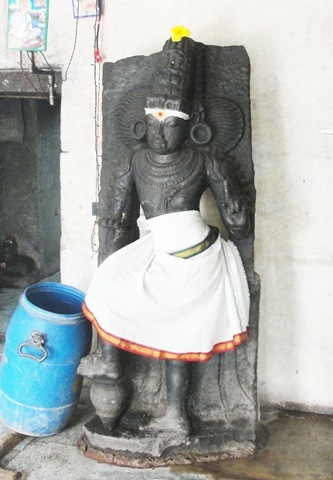 In some Siva statues, Siva is standing with one foot on Kubera’s head, indicating that Siva is the sole master and dispenser of the treasure. Another beautiful view of Arunachala. 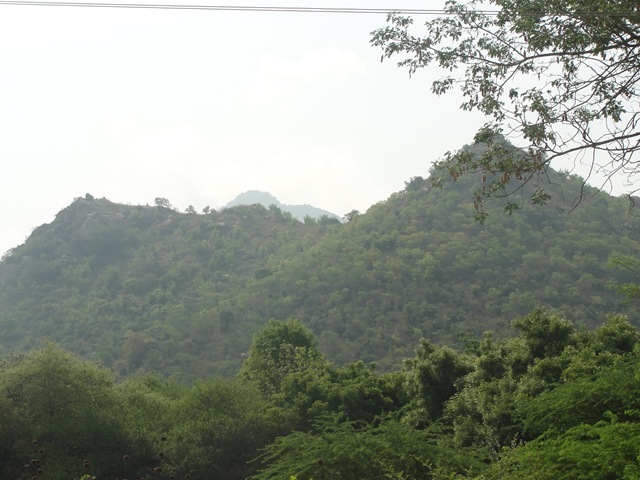 The view of Arunachala keeps changing as we round the hill. 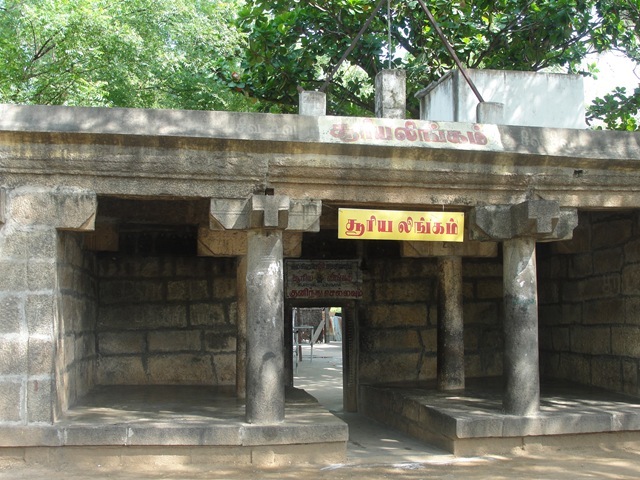 Next, on the right is Idukku Pillayar Koil, known also as the ‘Squeeze-though temple.” It is a miniature shrine dedicated to the Lord Ganesha.It is believed that sincere desires are fulfilled by going through this passage with a prayer in the heart. After 100 meters, you can see the Pancha Mukha Darshan (Five Faced Vision). 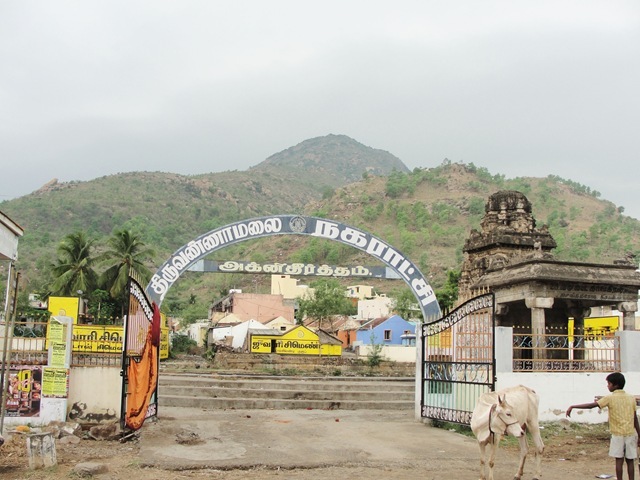 From this spot one can see the five faces of Siva that appear on Arunachala. 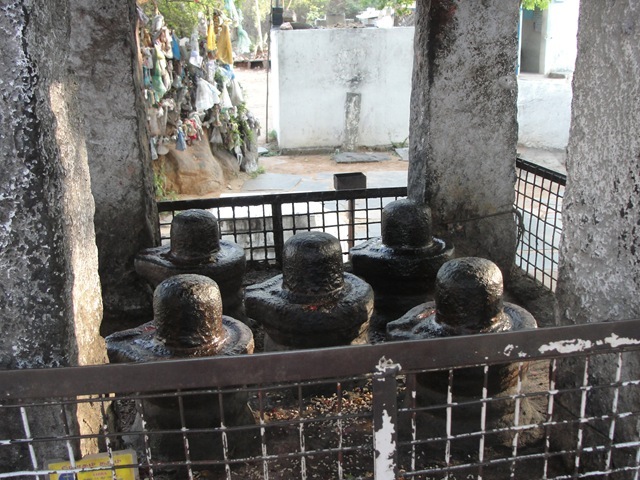 Naturally there are five lingams here, representing each of the faces. 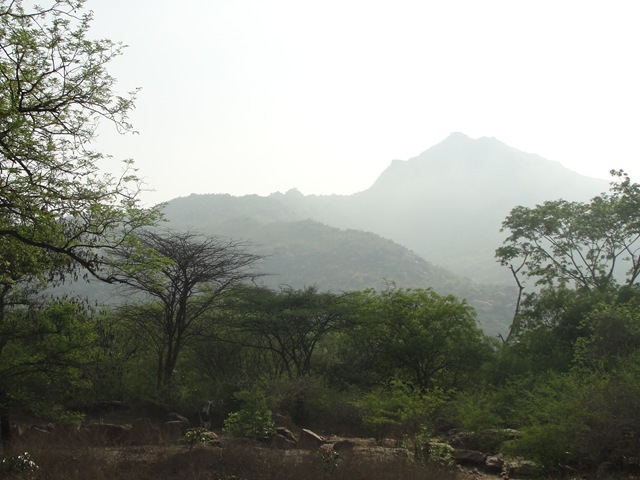 Here is the view of Arunachala from the Pancha Mukha Darshan. Just before the Pancha Mukha Darshan there are two other shines. Here is the main idol in one of them. Here is the other. First from the road. Then inside the shrine. I do not know what god this is. 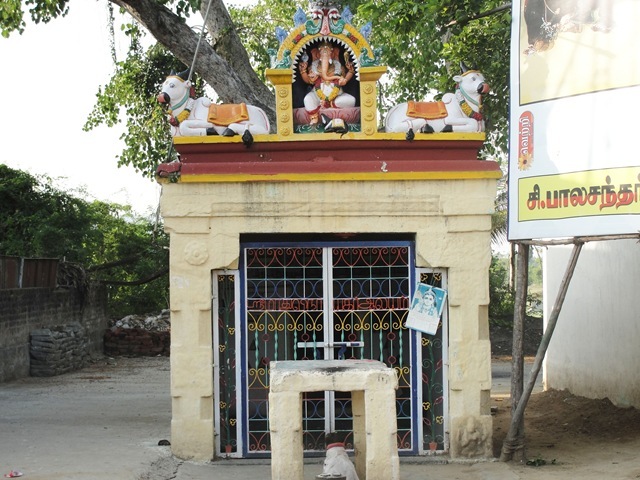 At the corner of Girivalam and Velore roads is a Balaji (Vishnu) Temple. 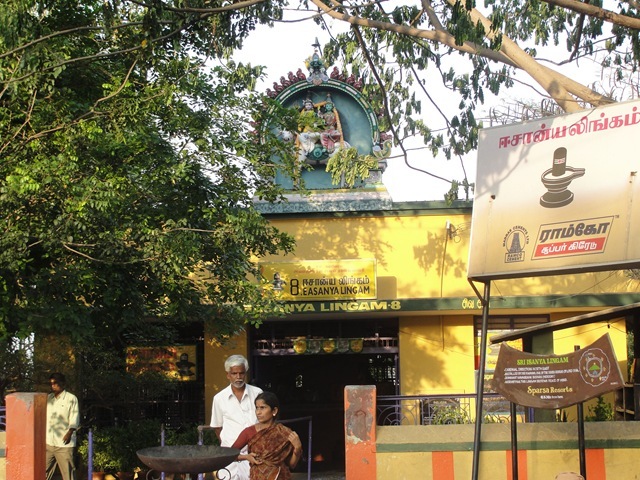 Continuing on the main Pradakshina route, bearing left after the junction of Girivalam and Velore roads, you arrive at Esanya Lingam. Esanya is the guardian of the northeast. 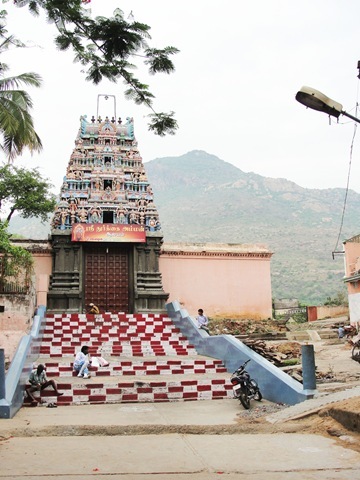 Esanya is one of the names of Rudra Siva, who worshipped Lord Arunachala here. He represents the purifying principle. It is the name given to the summit of Mount Arunachala. Rudra Siva is the one who is surrounded by bhootha ganas and pramathas (ghosts and spirits). He wears a tiger skin and his body is smeared with ashes. He often plays a damaru (drum) and lets out great bursts of laughter, which echo in all the heavens. 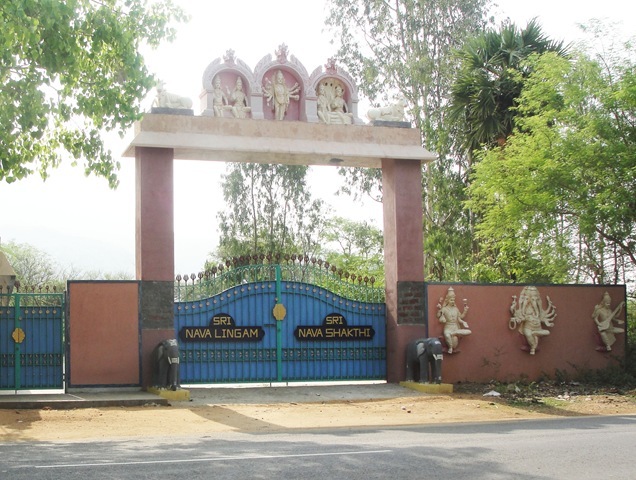 Opposite this lingam and ahead about 50 meters is the Sri Esanya Jnana Desikar Mutt and Samadhi Temple. Kandappa Desikar was later called Esanya Jnana Desikar, since he settled down near Esanya Tirtham. Kandappa Desikar ministered to the sick and suffering, and his fame spread far and wide. A European Collector suffering from incurable Asthma met him, and was cured miraculously. 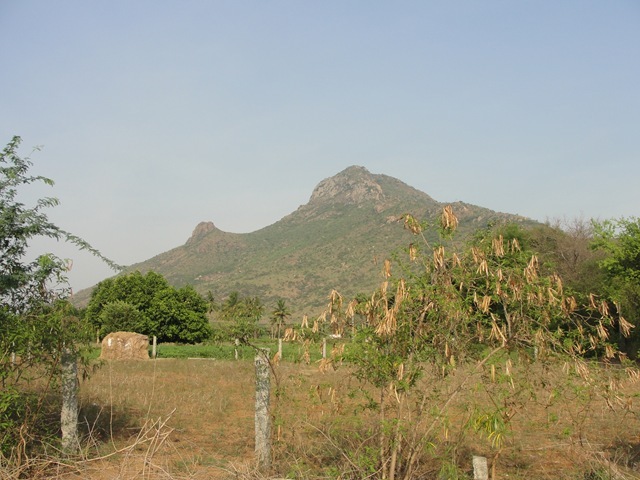 It is said that Lord Arunachala took the form of tigers to keep guard around this sage when he was absorbed in meditation on the Hill Arunachala. He attained Mahasamadhi (merged with the Almighty) in 1829. Here Bhagavan Ramana was made to give a discourse on the Bhagavad Gita. This was the first and the last time Bhagavan ever gave a public discourse. 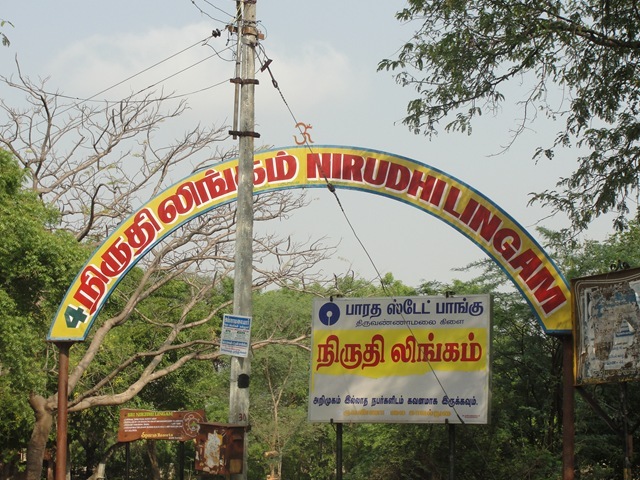 You can also turn right at the intersection of Girivalam and Velore Roads, and see the arch to Pachaiamman Koil to the right. Go up the hill to the temple. As you continue to walk, you will pass by the bus stand, then come to an intersection with a obelisk in the center of the intersection. 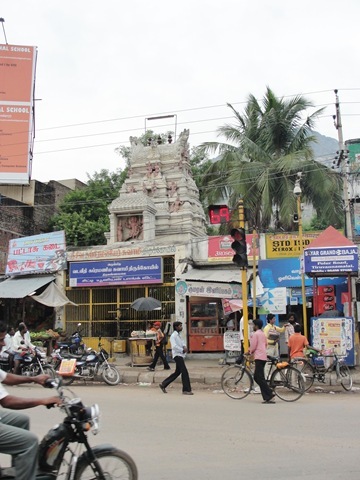 Across the road, on the right side is the Shanmukha (Subramanya) Temple. Shanmukha is the Lord depicted with six faces and is the son of Lord Siva. Look up to see its gopuram. In this temple, a mirror is kept behind the deity, which allows the devotee full darshan of the six-faced Lord. 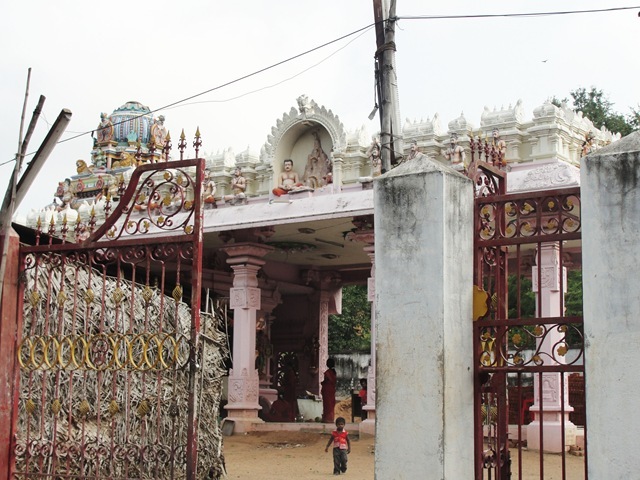 Continuing on the walk, at the third corner, turn right and you will see Kamakshi Temple directly ahead at the end of the street. 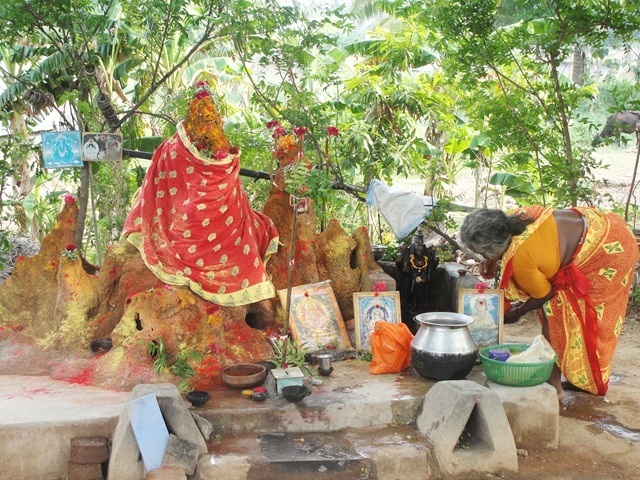 Kamakshi is one of the aspects of Siva’s Sakti (Parvati). She is said to grant all the wishes of those who invoke her, merely by her gracious glance. 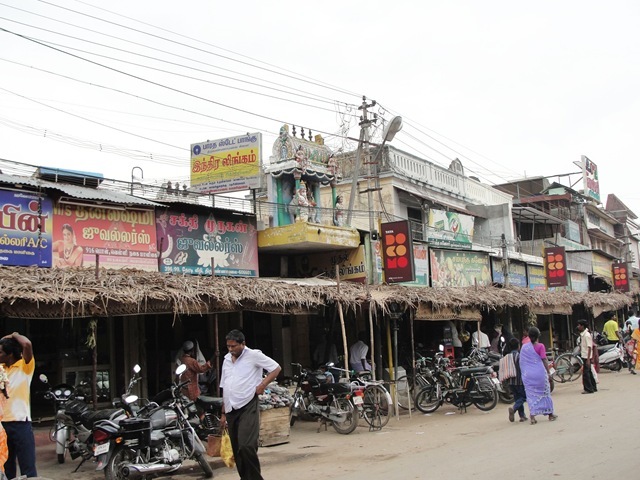 Return to the main road, turn right, and soon, to the right, you will see a Durga Temple. 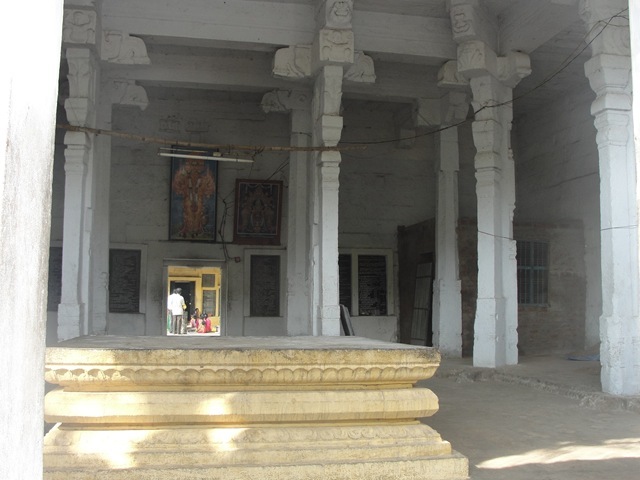 Inside the Durga Temple, there is the Khadga Tirtham on the left as you face the deity. It was formed when Durga struck her sword against the rock. The colorful gopuram of the Durga Temple. 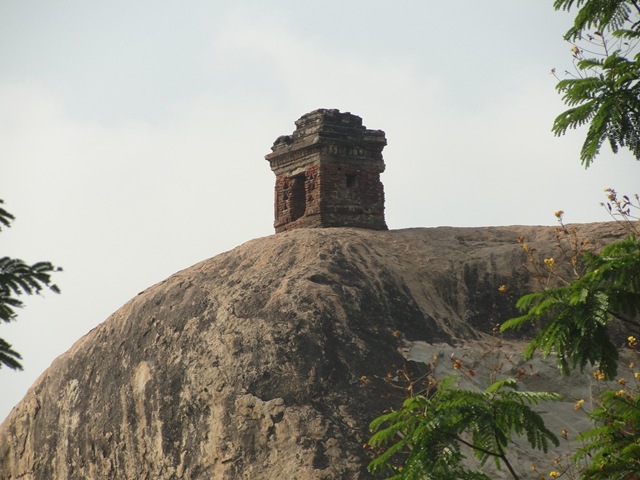 IF you walk to the right of the Durga Temple, you will have a good view of Pavalakkunru Temple sitting high on a hill. 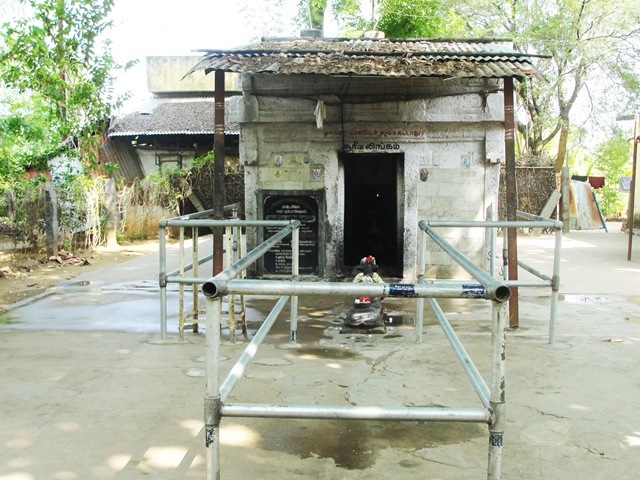 Pavalakkunru is where Bhagavan was met by his mother for the first time after he left Madurai and came to Arunachala. 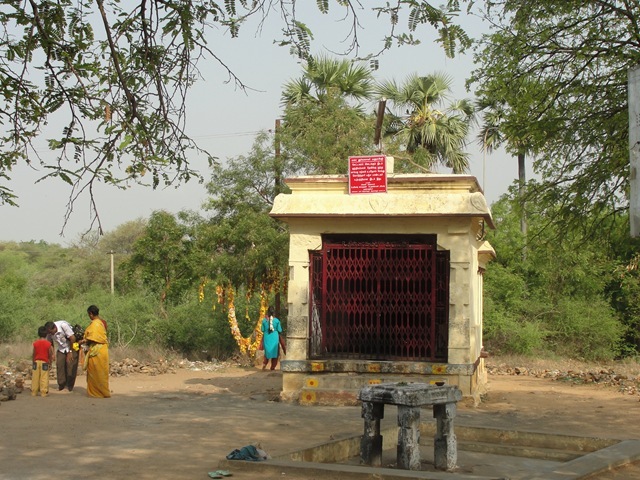 Pavalakkunru is the site where Parvati merged with Siva to become Ardhanariswara. Continue on the walk until you arrive at Arunachaleswara Temple, one of the grandest Siva temples in India. Some call it the home of Saivism. 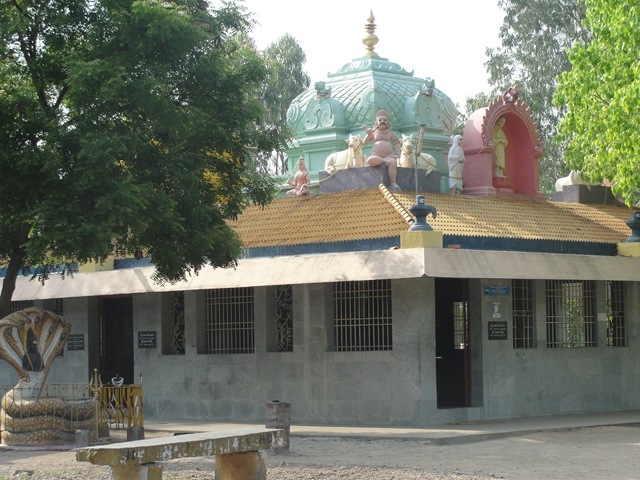 The temple occupies about 25 acres of land. The walls on the East and West measure 700 feet each. The South wall is 1479 feet long and North wall is 1590 feet. The Rajagopuram which adorns the East Gateway is 217 feet high, making it the tallest in India. Turn right, walk up the hill, and turn left at a “T” intersection. This road will take you back to Sri Ramanasramam. Along the way you will find, to the left, Agni Mantapam. Across the street is Agni Tirtham. 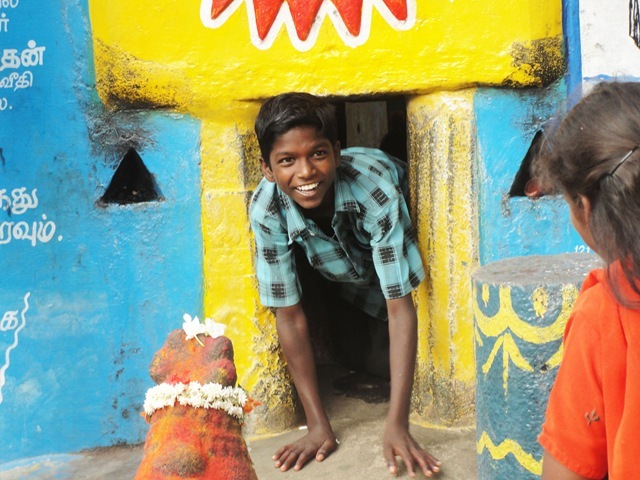 Follow along the road, and you will see an arch for Agni Lingam. Turn right and walk up the street about 50 metres. 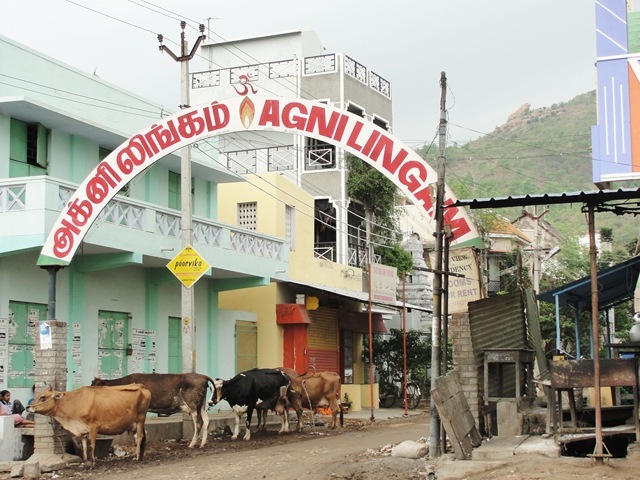 There you will find Agni Lingam, the last of the eight cardinal lingams that surround Arunachala. Agni is the God of fire, the sacrificial fire, and the principal god of the Vedas. There are three aspects of Agni: Agni, the gross one which burns; Agni, the gross-subtle, which the sacrificial fire through which oblations are given to the gods; and Jnanagni, the subtle fire which burns within one’s own self to have Self-knowledge. Agni’s mount is the ram. He appears with three heads representing the Creator, Sustainer, and Destroyer. When he has two heads, he represents two paths; one of manifestation and the other of liberation. The forked flame of Agni consumes the impure and liberates the pure. Agni is the mediator between men and the gods. Walk back down the street and turn right. On the left side of the street is Mahakali Temple. Mahakali, literally translated as Great Kali, is a Hindu Goddess, considered by some to be the consort of Siva, and by others as the basis of Reality. Mahakali in Sanskrit is etymologically the feminized variant of Mahakala or Great Time (which is interpreted also as Death), an epithet of the God Siva in Hinduism. Mahakali is not another name of the dark Goddess Kali, who is the force of the anger of Durga but an aspect of the Mahashakti and therefore her color is light blue. Next to the temple there are vendors selling items with which to worship Mahakali: flower malas, camphor, and especially limes. You will see crushed limes littered on the ground near the temple, and impaled on the Trishul (Siva’s trident) in front of the temple. 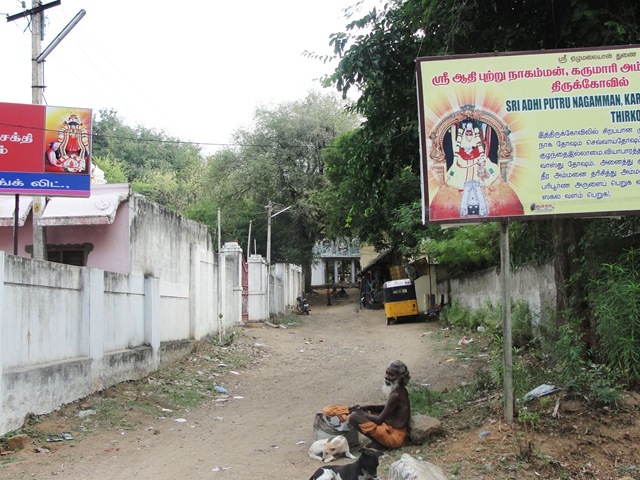 Continuing the walk, near the entrance to Sri Ramanasramam you fill find the Dakshinamurti Shrine on the right. Dakshinamurti means ‘Southward Facing.’ The Guru is the spiritual north Pole and therefore traditionally faces south. Dakshinamurti, the primordial Guru, is Siva incarnate in a youthful form, teaching in silence. He is one of the five aspects of Lord Siva. He taught the four sons of Brahma Self-Knowledge while sitting near Lake Manasasarovar, at Mount Kailas in the Himalayas. 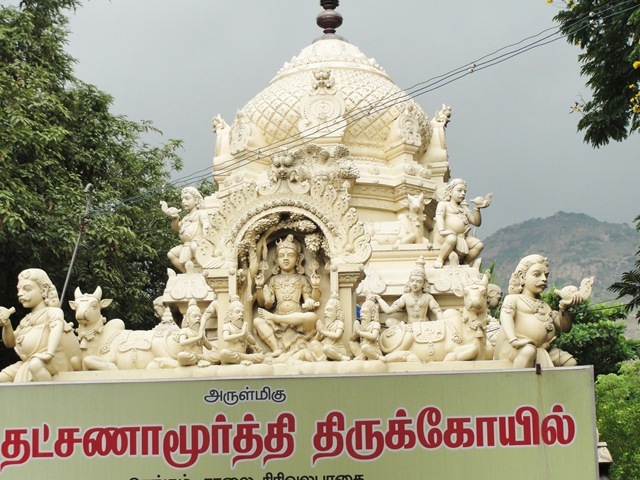 On Thursdays the Dakshinamurti shrine is opened and devotees line up for His darshan. Bhagavan Ramana has been compared to Dakshinamurti, as he continues to teach in silence, and usually sat facing the south. This takes you back to Sri Ramanasramam. It is customary to then go into the Ramana shrine and give thanks for the Pradakshina. I want to thank the authors of A Guide to Pradakshina for the use of some descriptive materials and place names. Wikipedia searches also provided background information on many Hindu gods, etc. 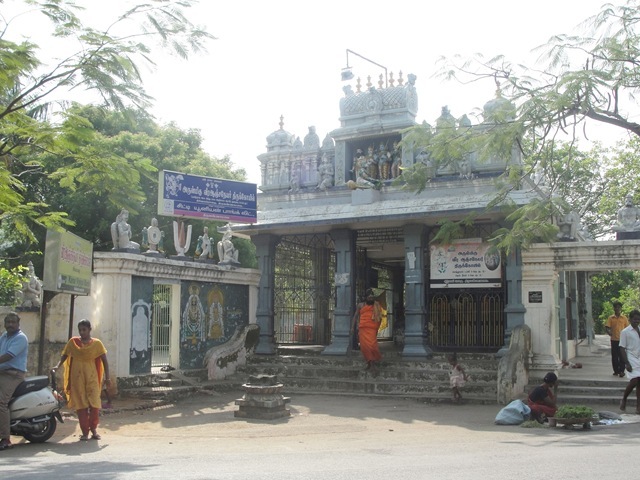 This entry was posted on May 29, 2010 at 1:47 pm and is filed under Arunachala, Ramana Maharshi, Tamil Nadu, Temples, Shrines and Ashrams, Tiruvannamalai. You can follow any responses to this entry through the RSS 2.0 feed. You can leave a response, or trackback from your own site. My love for Arunachala and Ramana went into this. Thank you. Excellent post. Reading this is as good as doing the giri pradhakshanam! Great job Richard, not everyone in India is as blessed as you are. How I wish the TamilNadu government that makes crores and crores of money each year from all the Hindu temples, maintain the temples and the surrounding areas as it should be maintained. It is an eye sour to see plastic waste, temple walls painted with advertisements, temples and mandapams used to store waste materials, rusted sign boards, unauthorized shops and construction in temple lands, electric wires running haywire, etc. And I do not want to see marbles laid out in these ancient temples as well, just clean surrounding, clear sign boards, a divine environment is what is needed. Arunachala should send HIS order to people concerned! Sir,What you have posted is fantastic.Can you go on and dig out some more details of these temples,their historical origin ,the benefits of praying there and publish in a book form if possible through Sri Ramanashramam so that we can get a low cost edition . Thanks for putting names to the temples and helping me out. I lost my direction in certain sections of you post, could please clarify me. 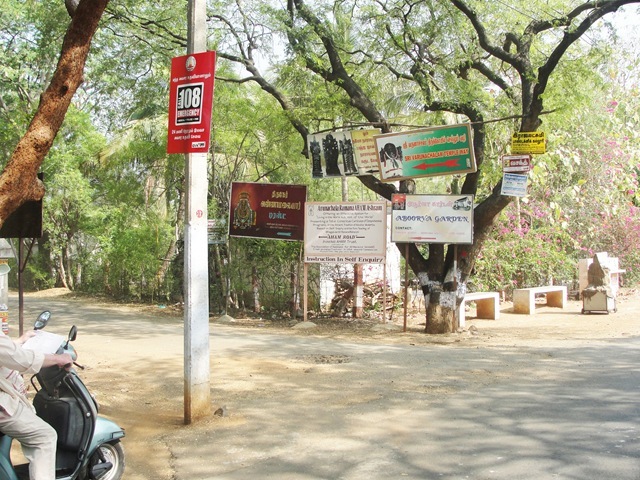 1) The point at Manakkula Vinayaker Temple(this road leads to Yogi Ramasurat kumar ashram its banner can be seen in photo) Here ‘Turning right onto the street at the end of the ashram property, one moves into Palakothu’, you meant i should stick to Ramana ashram side, this leads to Palakothu? I want to visit the ‘Agastya Tirtham’, the photo of the pond is picturesque. There is water too. 2) At the Devi temple should i move away from the road to inner side of the mountain to reach Peace Park. 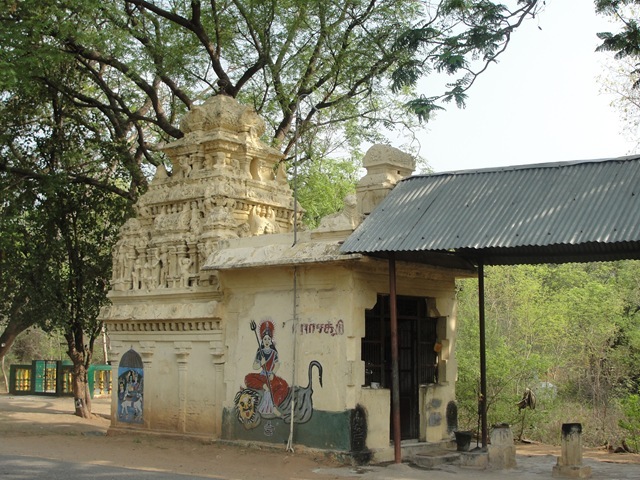 3)At Draupadi Amman Temple, is the temple, what are timings of this temple, its history, please. 4) Have done any research on the said tunnel. I’m visiting T.V.Malai on June 4 for the Mahapuja(June 6). Like to travel in the inner path(first time), anybody interested in helping me and joining me. Sorry for not being clear on all this. 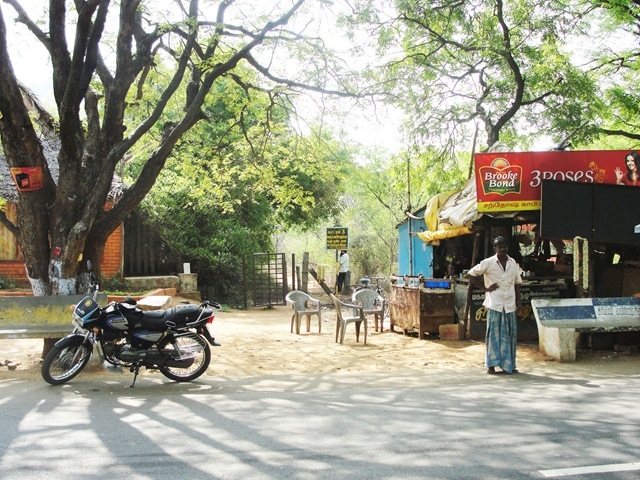 1. there is a dirt street right at the end of the Ramanasramam property, the first right turn possible off Chengam Road. Turn right here. 2. The Peace Park is further along Chengam Road. 3. I do not have this history and information yet. If you find out, let us all know. 4. The tunnel I have heard about in many stories about the tunnel. I have heard nothing more concrete than stories. And I have heard many stories about many things here, often conflicting. You can contact one of the mountain guides in the ‘resources’ page. Saran is a good young man, who headed the crew that created the Inner Inner Path (the ‘Yellow Path.’_ I will be in the USA then. Thank you for the time, effort and research to take us through this beautiful journey. I learnt many new things like the piece of hill dropped by Hanuman, yama’s tank etc., etc. 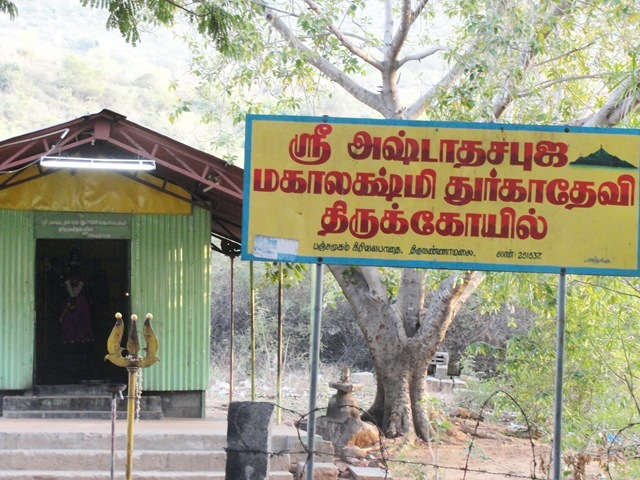 The name board in tamil reads as “Ashtasapuja Mahalakshmi Durgadevi temple”. The word “Äshta”means “eight”. The deity inside the shrine has eight hands. Hence it could be that the deity is “”Mahalakshmi Durgadevi with eight hands”. It may also have some relevance to the eight directions. it is the best of posting by mr richard. Simply saying “thanks” is too little, Mr Richard. even though i am coming to Arunachala for the past 25yrs. That is why I write about this. Arunachala is loved by many, both Indians and westerners. 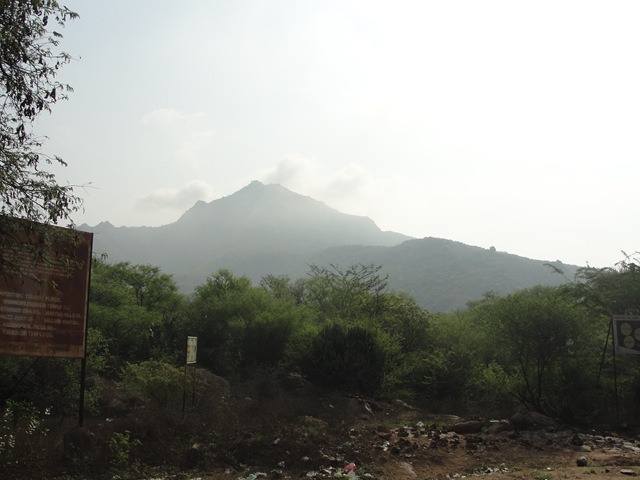 And still there is so much about Arunachala that is unseen by the loving visitors. 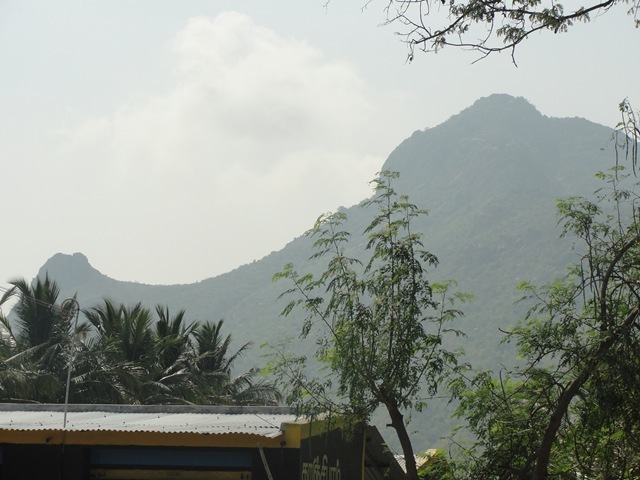 I am privileged to be able to explore Arunachala and life in South India, and share this with you. It is all Arunachala’s Grace.